Ioana Bianca AnuЕЈa was born on August 29, 1994. Ioana's talent has been noticed in the early childhood, but not enough of attention has been paid to it. "I sing since I was little. 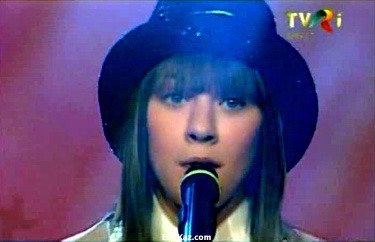 I sang music from commercials and everyone told me I have voice, but I did not care at that time", tells Ioana. 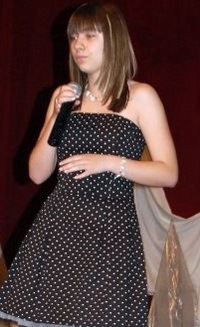 So her first step to musical career was done only three years ago, when she took part in the school competition. "The reaction from my performance there strengthened me and my parents, I went to believe in my talent and that I should cultivate it", recalls the singer. "I slowly felt that I could express myself in a proper way through songs. My parents have supported me and my teachers were understanding". In 2007 she began seriously dealing with the music, even if it meant fewer trips with friends, less fun and less rest and immediately succeeded at the festival "Flori de gheata". 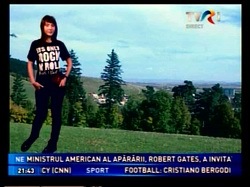 "For 2 years I have been studying vocals in Bucharest. For the first time I've been taking lessons from a composer Cristian Alivej, he is also was the one that spurred me and made me trust in myself, and my talent", says Ioana. Soon after she started taking singing lessons from Crina Mardare. "I am very happy, my voice has changed a lot since working with her", she explains. Ioana has recently graduated from "Eugen Ionescu" school in Slatina now is student of National College "Ion Minulescu", philology department, entering it with average grade of 9.88. After finishing high school she wants to continue her studies at the Conservatory. Ioana has a busy program, especially that she wants to have good results at school. 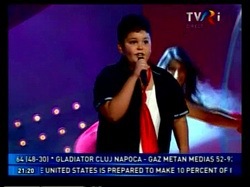 "I leave home at 6 am, to reach Bucharest at 10, for 2 hours I'm singing, then go straight to school. In the evening I return home to do my homework for the next day", describes singer how her basic day looks like. Now singer has more than 25 notable appearances in the festivals in her CV, including "Stelele Dunarii", "Ursuletul de aur", "Star Musik", "Flori de Mai", "Nymphea", "Camena", "Potaissa", "Fulg de nea" all across Romania. After winning second place at the Festival "Mamaia copiilor", Ioana Anuta won first prize at the festival "Golden Stag Junior" in 14-17 age category. She performed song "Cerul" of the band Proconsul. "If you win, you must continue taking part to prove your success. If you loose, you need to continue to prove you're capable of winning". 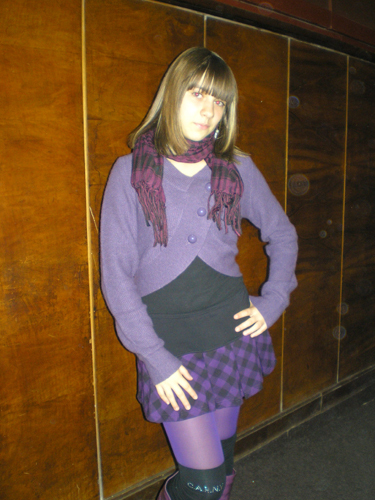 Besides singing Ioana loves dancing and going out with friends when she has time to do it and has good grades. Otherwise, in her free time she simply rests to recover herself. "I want everyone to be proud of me", says Ioana. In her spare time she listens to the music, mostly pop and easy listening one. Ioana hates doing cleaning in the house, washing dishes and using vacuum cleaner. She hates when people turn to be fake friends. You can listen to the songs of Ioana on her Trilulilu profile and on her fan site and watch videos of her performances on her Youtube channel. Since devoting her life to the music, Ioana has performed with Alb-Negru, Mihai TrДѓstariu, Anda Adam and Nico. She participated in many festivals and won many awards, but going to the Junior Eurovision is the biggest of all challenges. "Since I was little I wanted to go to Eurovision", admits Ioana. She admits that to win one has to create a real show on stage. "In addition to singing classes, I have to spend hours on practicing choreography for the stage performance. I only hope that selection will be fair and I am able to win many supporters. I hope they like my song "The power in your hand" as much as I do myself", was telling singer prior to preselection. "We are in top form, though had to spend a lot of time on road lately, between singing and rehearsals. It's a nice atmosphere here and we are a united team. I have never seen anything like that before. It's hard, but very nice, it's professionalism", said Ioana Anuta, just before the contest. "I have emotions but I want them to be constructive emotions, because otherwise they can ruin everything we've been working for a whole year" added she. 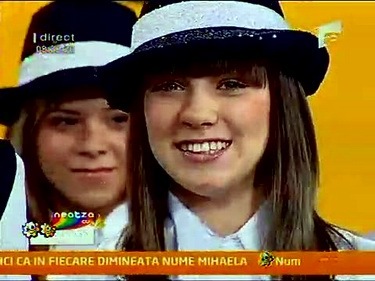 Song, which Ioana will perform at Junior Eurovision was written by girl herself. In addition to music an exceptional show has been prepared as well. "I will be on stage with 5 dancers from "Future M&Q" formation from Oradia (Ivana Farc, Cristina Pandrea, Alexandra Sabau, Andreea Margin and Diana Pacurar). They are good girls. Although we're from different cities, we've been meeting in different festivals and competitions before. I received many words of praise for our performance", pointed Ioana. "Now we will travel to Kiev to win! ", she adds. Fellow citizen of Slatina have posted posters of Ioana asking everyone to vote for young singer. "We are with her. It is a first time our students got that far. We are all proud of her. Both teachers and our students will vote for Ioana", said Iliuta Braileanu, director of the Palace of Children named after Adrian BДѓran in Slatina. As usual, Romanian commentators of the show will be Ioana Isopescu and Alexandru Nagy (commentators of all JESC in the past) and Iulia Cobanu will deliver results of Romanian voting as she did in the last 2 years as well. Р�РѕР°РЅР° Р‘СЊСЏРЅРєР° РђРЅСѓС†Р° СЂРѕРґРёР»Р°СЃСЊ 29РіРѕ Р°РІРіСѓСЃС‚Р° 1994 РіРѕРґР°. РўР°Р»Р°РЅС‚ Р�РѕР°РЅС‹ Р±С‹Р» Р·Р°РјРµС‡РµРЅ СѓР¶Рµ РІ РµРµ СЂР°РЅРЅРµРј РґРµС‚СЃС‚РІРµ, РЅРѕ РЅР° РЅРµРіРѕ РЅРµ РѕР±СЂР°С‚РёР»Рё РѕСЃРѕР±РѕРіРѕ РІРЅРёРјР°РЅРёСЏ. "РЇ РїРµР»Р° РµС‰Рµ РјР°Р»РµРЅСЊРєРѕР№, РїРѕРґРїРµРІР°Р»Р° РјСѓР·С‹РєРµ СЃ СЂРµРєР»Р°Рј, Рё РІСЃРµ РіРѕРІРѕСЂРёР»Рё РјРЅРµ, С‡С‚Рѕ Сѓ РјРµРЅСЏ С…РѕСЂРѕС€РёР№ РіРѕР»РѕСЃ, РЅРѕ РІ С‚Рѕ РІСЂРµРјСЏ РјРµРЅСЏ СЌС‚Рѕ РЅРµ СЃР»РёС€РєРѕРј РІРѕР»РЅРѕРІР°Р»Рѕ", СЂР°СЃСЃРєР°Р·С‹РІР°РµС‚ Р�РѕР°РЅР°. РџРѕСЌС‚РѕРјСѓ РїРµСЂРІС‹Рµ С€Р°РіРё РЅР° РїСѓС‚Рё Рє РјСѓР·С‹РєР°Р»СЊРЅРѕР№ РєР°СЂСЊРµСЂРµ Р±С‹Р»Рё СЃРґРµР»Р°РЅС‹ С‚РѕР»СЊРєРѕ С‚СЂРё РіРѕРґР° РЅР°Р·Р°Рґ, РєРѕРіРґР° РѕРЅР° РїСЂРёРЅСЏР»Р° СѓС‡Р°СЃС‚РёРµ РІ С€РєРѕР»СЊРЅРѕРј РєРѕРЅРєСѓСЂСЃРµ. "Р РµР°РєС†РёСЏ РЅР° РјРѕРµ РёСЃРїРѕР»РЅРµРЅРёРµ РїСЂРёРґР°Р»Р° СЃРёР»С‹ РјРЅРµ Рё РјРѕРёРј СЂРѕРґРёС‚РµР»СЏРј, СЏ РїРѕРІРµСЂРёР»Р° РІ СЃРІРѕР№ С‚Р°Р»Р°РЅС‚ Рё РІ С‚Рѕ, С‡С‚Рѕ РјРЅРµ РЅР°РґРѕ РµРіРѕ СЂР°Р·РІРёРІР°С‚СЊ", РІСЃРїРѕРјРёРЅР°РµС‚ РїРµРІРёС†Р°. "РЇ РїРѕ-РЅРµРјРЅРѕРіСѓ РЅР°С‡Р»Р° С‡СѓРІСЃС‚РІРѕРІР°С‚СЊ, С‡С‚Рѕ СЏ РјРѕРіСѓ РІС‹СЂР°Р·РёС‚СЊ СЃРµР±СЏ С‡РµСЂРµР· РїРµСЃРЅРё. РњРѕРё СЂРѕРґРёС‚РµР»Рё РїРѕРґРґРµСЂР¶Р°Р»Рё РјРµРЅСЏ Рё СѓС‡РёС‚РµР»СЏ С‚РѕР¶Рµ РІРѕС€Р»Рё РІ РїРѕР»РѕР¶РµРЅРёРµ". Р’ 2007 РіРѕРґСѓ Р�РѕР°РЅР° РЅР°С‡С‡РёРЅР°РµС‚ СЃРµСЂСЊРµР·РЅРѕ Р·Р°РЅРёРјР°С‚СЊСЃСЏ РјСѓР·С‹РєРѕР№, РЅРµСЃРјРѕС‚СЂСЏ РЅР° С‚Рѕ, С‡С‚Рѕ СЌС‚Рѕ РѕР·РЅР°С‡Р°РµС‚ РјРµРЅСЊС€Рµ РїСЂРѕРіСѓР»РѕРє СЃ РґСЂСѓР·СЊСЏРјРё, РјРµРЅСЊС€Рµ СЂР°Р·РІР»РµС‡РµРЅРёР№, Рё РјРµРЅСЊС€Рµ РѕС‚РґС‹С…Р°, Рё РЅРµРјРµРґР»РµРЅРЅРѕ РґРѕР±РёРІР°РµС‚СЃСЏ СѓСЃРїРµС…Р° РЅР° С„РµСЃС‚РёРІР°Р»Рµ "Flori de gheata". "Р’ С‚РµС‡РµРЅРёРё РґРІСѓС… Р»РµС‚ СЏ Р·Р°РЅРёРјР°СЋСЃСЊ РІРѕРєР°Р»РѕРј РІ Р‘СѓС…Р°СЂРµСЃС‚Рµ. РЎРЅР°С‡Р°Р»Р° СЏ Р±СЂР°Р»Р° СѓСЂРѕРєРё Сѓ РєРѕРјРїРѕР·РёС‚РѕСЂР° РљСЂРёСЃС‚РёР°РЅР° РђР»РёРІРµСЏ, РёРјРµРЅРЅРѕ РѕРЅ Р±С‹Р» С‚РµРј, РєС‚Рѕ РїСЂРёРґР°Р» РјРЅРµ СѓРІРµСЂРµРЅРЅРѕСЃС‚СЊ РІ СЃРµР±Рµ Рё Р·Р°СЃС‚Р°РІРёР» РїРѕРІРµСЂРёС‚СЊ РІ СЃРІРѕР№ С‚Р°Р»Р°РЅС‚", РіРѕРІРѕСЂРёС‚ Р�РѕР°РЅР°. Р’СЃРєРѕСЂРµ РѕРЅР° РЅР°С‡РёРЅР°РµС‚ Р±СЂР°С‚СЊ СѓСЂРѕРєРё РІРѕРєР°Р»Р° Сѓ РљСЂРёРЅС‹ РњР°СЂРґР°СЂРµ. "РЇ РѕС‡РµРЅСЊ СЂР°РґР°, РјРѕР№ РіРѕР»РѕСЃ СЃРёР»СЊРЅРѕ РёР·РјРµРЅРёР»СЃСЏ СЃ С‚РѕРіРѕ РІСЂРµРјРµРЅРё, РєР°Рє СЏ РЅР°С‡Р°Р»Р° СЂР°Р±РѕС‚Р°С‚СЊ СЃ РЅРµР№". РќРµРґР°РІРЅРѕ Р�РѕР°РЅР° Р·Р°РєРѕРЅС‡РёР»Р° СЃСЂРµРґРЅСЋСЋ С€РєРѕР»Сѓ РІ РЎР»Р°С‚РёРЅРµ Рё РїРѕСЃС‚СѓРїРёР»Р° РІ РЅР°С†РёРѕРЅР°Р»СЊРЅС‹Р№ РєРѕР»Р»РµРґР¶ РЅР° С„Р°РєСѓР»СЊС‚РµС‚ С„РёР»РѕР»РѕРіРёРё СЃРѕ СЃСЂРµРґРЅРёРј Р±Р°Р»Р»РѕРј РІ 9.88. РџРѕСЃР»Рµ РµРіРѕ РѕРєРѕРЅС‡Р°РЅРёСЏ РѕРЅР° РїР»Р°РЅРёСЂСѓРµС‚ РїСЂРѕРґРѕР»Р¶РёС‚СЊ РѕР±СѓС‡РµРЅРёРµ РІ РєРѕРЅСЃРµСЂРІР°С‚РѕСЂРёРё. РЈ Р�РѕР°РЅС‹ РІРµСЃСЊРјР° РЅР°СЃС‹С‰РµРЅРЅР°СЏ РїСЂРѕРіСЂР°РјРјР°, РїРѕС‚РѕРјСѓ С‡С‚Рѕ РѕРЅР° С‚Р°РєР¶Рµ С…РѕС‡РµС‚ РґРѕСЃС‚РёРіР°С‚СЊ С…РѕСЂРѕС€РёС… СЂРµР·СѓР»СЊС‚Р°С‚РѕРІ Рё РІ СѓС‡РµР±Рµ. "РЇ РІСЃС‚Р°СЋ РІ 6 СѓС‚СЂР°, РїСЂРёРµР·Р¶Р°СЋ РІ Р‘СѓС…Р°СЂРµСЃС‚ Рє 10С‚Рё, РґРІР° С‡Р°СЃР° Р·Р°РЅРёРјР°СЋСЃСЊ РІРѕРєР°Р»РѕРј, Р·Р°С‚РµРј РёРґСѓ РІ С€РєРѕР»Сѓ. Р’РµС‡РµСЂРѕРј СЏ РІРѕР·РІСЂР°С‰Р°СЋСЃСЊ РґРѕРјРѕР№ Рё РґРµР»Р°СЋ РґРѕРјР°С€РЅСЋСЋ СЂР°Р±РѕС‚Сѓ РЅР° СЃР»РµРґСѓСЋС‰РёР№ РґРµРЅСЊ", РѕРїРёСЃС‹РІР°РµС‚ РїРµРІРёС†Р°. РЎРµР№С‡Р°СЃ РЅР° РµРµ СЃС‡РµС‚Сѓ СѓР¶Рµ Р±РѕР»РµРµ 25 Р·РЅР°С‡РёС‚РµР»СЊРЅС‹С… РІС‹СЃС‚СѓРїР»РµРЅРёР№ РІ С„РµСЃС‚РёРІР°Р»СЏС…, РІРєР»СЋС‡Р°СЏ "Stelele Dunarii", "Ursuletul de aur", "Star Musik", "Flori de Mai", "Nymphea", "Camena", "Potaissa", "Fulg de nea" РїРѕ РІСЃРµР№ Р СѓРјС‹РЅРёРё. Р’СЃРєРѕСЂРµ РїРѕСЃР»Рµ Р·Р°РІРѕРµРІР°РЅРёСЏ РІС‚РѕСЂРѕРіРѕ РјРµСЃС‚Р° РЅР° "Mamaia copiilor" Р�РѕР°РЅР° РђРЅСѓС†Р° Р·Р°РІРѕРµРІР°Р»Р° Рё РїРµСЂРІС‹Р№ РїСЂРёР· РЅР° С„РµСЃС‚РёРІР°Р»Рµ "Golden Stag Junior" РІ РєР°С‚РµРіРѕСЂРёРё РѕС‚ 14 РґРѕ 17 Р»РµС‚. РћРЅР° РёСЃРїРѕР»РЅРёР»Р° РїРµСЃРЅСЋ "Cerul" РіСЂСѓРїРїС‹ Proconsul. "Р•СЃР»Рё С‚С‹ РїРѕР±РµР¶РґР°РµС€СЊ, С‚Рѕ С‚С‹ РІСЃРµ СЂР°РІРЅРѕ РґРѕР»Р¶РµРЅ РїСЂРѕРґРѕР»Р¶Р°С‚СЊ СѓС‡Р°СЃС‚РІРѕРІР°С‚СЊ РІ РєРѕРЅРєСѓСЂСЃР°С…, С‡С‚РѕР±С‹ РїРѕРґС‚РІРµСЂРґРёС‚СЊ СЃРІРѕР№ СѓСЃРїРµС…. Р•СЃР»Рё С‚С‹ РїСЂРѕРёРіСЂС‹РІР°РµС€СЊ - С‚Рѕ РЅР°РґРѕ СѓС‡Р°СЃС‚РІРѕРІР°С‚СЊ, С‡С‚РѕР±С‹ РґРѕРєР°Р·Р°С‚СЊ, С‡С‚Рѕ С‚С‹ РјРѕР¶РµС€СЊ РїРѕР±РµРґРёС‚СЊ". РџРѕРјРёРјРѕ РїРµРЅРёСЏ Р�РѕР°РЅР° Р»СЋР±РёС‚ С‚Р°РЅС†РµРІР°С‚СЊ Рё РїСЂРѕРІРѕРґРёС‚СЊ РІСЂРµРјСЏ СЃ РґСЂСѓР·СЊСЏРјРё, РµСЃР»Рё Сѓ РЅРµРµ РµСЃС‚СЊ РЅР° СЌС‚Рѕ РІСЂРµРјСЏ Рё Сѓ РЅРµРµ С…РѕСЂРѕС€РёРµ РѕС†РµРЅРєРё РІ С€РєРѕР»Рµ. Р’ РѕСЃС‚Р°Р»СЊРЅРѕРµ СЃРІРѕР±РѕРґРЅРѕРµ РІСЂРµРјСЏ РѕРЅР° РїСЂРѕСЃС‚Рѕ РѕС‚РґС‹С…Р°РµС‚, С‡С‚РѕР±С‹ РІРѕСЃСЃС‚Р°РЅРѕРІРёС‚СЊ СЃРІРѕРё СЃРёР»С‹. "РЇ С…РѕС‡Сѓ, С‡С‚РѕР±С‹ РІСЃРµ РіРѕСЂРґРёР»РёСЃСЊ РјРЅРѕСЋ", РіРѕРІРѕСЂРёС‚ Р�РѕР°РЅР°. Р’ СЃРІРѕР±РѕРґРЅРѕРµ РІСЂРµРјСЏ РѕРЅР° СЃР»СѓС€Р°РµС‚ РјСѓР·С‹РєСѓ, РІ РѕСЃРЅРѕРІРЅРѕРј Р»РµРіРєСѓСЋ, РІ СЃС‚РёР»Рµ РїРѕРї. Р�РѕР°РЅР° С‚РµСЂРїРµС‚СЊ РЅРµ РјРѕР¶РµС‚ РґРµР»Р°С‚СЊ СѓР±РѕСЂРєСѓ РїРѕ РґРѕРјСѓ, РјС‹С‚СЊ РїРѕСЃСѓРґСѓ Рё РїС‹Р»РµСЃРѕСЃРёС‚СЊ. Р‘РѕР»СЊС€Рµ РІСЃРµРіРѕ РІ Р¶РёР·РЅРё РѕРЅР° РЅРµРЅР°РІРёРґРёС‚, РєРѕРіРґР° Р»СЋРґРё РѕРєР°Р·С‹РІР°СЋС‚СЃСЏ РїСЃРµРІРґРѕ-РґСЂСѓР·СЊСЏРјРё. РџСЂРѕСЃР»СѓС€Р°С‚СЊ РїРµСЃРЅРё Р�РѕР°РЅС‹ РІС‹ РјРѕР¶РµС‚Рµ РЅР° РµРµ РїСЂРѕС„РёР»Рµ Trilulilu Рё РЅР° РµРµ С„Р°РЅ-СЃР°Р№С‚Рµ, Р° РїРѕСЃРјРѕС‚СЂРµС‚СЊ РІРёРґРµРѕ РІС‹СЃС‚СѓРїР»РµРЅРёР№ РЅР° РєР°РЅР°Р»Рµ Youtube. РџРѕСЃР»Рµ С‚РѕРіРѕ, РєР°Рє РѕРЅР° РїРѕСЃРІСЏС‚РёР»Р° СЃРІРѕСЋ Р¶РёР·РЅСЊ РїРµРЅРёСЋ, Р�РѕР°РЅР° РІС‹СЃС‚СѓРїР°Р»Р° СЃ Alb-Negru, РњРёС…Р°РµРј РўСЂР°Р№СЃС‚Р°СЂРёСѓ, РђРЅРґРѕР№ РђРґР°Рј Рё РќРёРєРѕ. РћРЅР° РїСЂРёРЅРёРјР°Р»Р° СѓС‡Р°СЃС‚РёРµ РІРѕ РјРЅРѕРіРёС… С„РµСЃС‚РёРІР°Р»СЏС…, РЅРѕ СѓС‡Р°СЃС‚РёРµ РІ Р”РµС‚СЃРєРѕРј Р•РІСЂРѕРІРёРґРµРЅРёРё - СЃР°РјС‹Р№ РіР»Р°РІРЅС‹Р№ РІС‹Р·РѕРІ. "Р•С‰Рµ СЃ СЂР°РЅРЅРµРіРѕ РґРµС‚СЃС‚РІР° СЏ РјРµС‡С‚Р°СЋ Рѕ Р•РІСЂРѕРІРёРґРµРЅРёРё", РїСЂРёР·РЅР°РµС‚ Р�РѕР°РЅР°. Р”Р»СЏ РїРѕР±РµРґС‹ РЅРµРѕР±С…РѕРґРёРјРѕ РїРѕРґРіРѕС‚РѕРІРёС‚СЊ РЅР°СЃС‚РѕСЏС‰РµРµ С€РѕСѓ РЅР° СЃС†РµРЅРµ, РїСЂРёР·РЅР°РµС‚ Р�РѕР°РЅР°. "Р’ РґРѕРїРѕР»РЅРµРЅРёРµ Рє Р·Р°РЅСЏС‚РёСЏРј РІРѕРєР°Р»РѕРј, СЏ РїСЂРѕРІРѕР¶Сѓ С‡Р°СЃС‹ РїСЂР°РєС‚РёРєСѓСЏ РЅР°С€Сѓ СЃС†РµРЅРёС‡РµСЃРєСѓСЋ С…РѕСЂРµРѕРіСЂР°С„РёСЋ. РЇ С‚РѕР»СЊРєРѕ РЅР°РґРµСЋСЃСЊ, С‡С‚Рѕ РѕС‚Р±РѕСЂ Р±СѓРґРµС‚ С‡РµСЃС‚РЅС‹Рј Рё СЏ СЃРјРѕРіСѓ Р·Р°РІРѕРµРІР°С‚СЊ РіРѕР»РѕСЃР° РїРѕРєР»РѕРЅРЅРёРєРѕРІ. РЇ РЅР°РґРµСЋСЃСЊ, С‡С‚Рѕ "РЎРёР»Р° РІ С‚РІРѕРёС… СЂСѓРєР°С…" РїРѕРЅСЂР°РІРёС‚СЃСЏ РёРј С‚Р°РєР¶Рµ, РєР°Рє Рё РјРЅРµ СЃР°РјРѕР№", РіРѕРІРѕСЂРёР»Р° РѕРЅР° РїРµСЂРµРґ РѕС‚Р±РѕСЂРѕРј. "РњС‹ РЅР°С…РѕРґРёРјСЃСЏ РІ РїСЂРµРєСЂР°СЃРЅРѕР№ С„РѕСЂРјРµ, С…РѕС‚СЏ РЅР°Рј Рё РїСЂРёС…РѕРґРёС‚СЃСЏ РїСЂРѕРІРѕРґРёС‚СЊ РјРЅРѕРіРѕ РІСЂРµРјРµРЅРё РІ РїСѓС‚Рё, РјРµР¶РґСѓ РїРµРЅРёРµРј Рё СЂРµРїРµС‚РёС†РёСЏРјРё. РЈ РЅР°СЃ СЃР»РѕР¶РёР»Р°СЃСЊ РѕС‚Р»РёС‡РЅР°СЏ РєРѕРјР°РЅРґР° СЃ РїСЂРµРєСЂР°СЃРЅРѕР№ Р°С‚РјРѕСЃС„РµСЂРѕР№. РЇ РЅРёРєРѕРіРґР° С‚Р°РєРѕРіРѕ СЂР°РЅСЊС€Рµ РЅРµ РІРёРґРµР»Р°. РЎР»РѕР¶РЅРѕ, РЅРѕ РјС‹ РїРѕРґС…РѕРґРёРј Рє СЌС‚РѕРјСѓ РїСЂРѕС„РµСЃСЃРёРѕРЅР°Р»СЊРЅРѕ", РїСЂРёР·РЅР°РІР°Р»Р° Р�РѕР°РЅР°. "РЈ РјРµРЅСЏ, РєРѕРЅРµС‡РЅРѕ Р¶Рµ, РµСЃС‚СЊ РІРѕР»РЅРµРЅРёРµ, РЅРѕ СЏ СЃРґРµСЂР¶РёРІР°СЋ РµРіРѕ, РїРѕС‚РѕРјСѓ С‡С‚Рѕ РїРѕРЅРёРјР°СЋ, С‡С‚Рѕ РЅРµРЅСѓР¶РЅС‹Рј РІРѕР»РЅРµРЅРёРµРј РјРѕР¶РЅРѕ СЂР°Р·СЂСѓС€РёС‚СЊ РІСЃРµ, Рє С‡РµРјСѓ РјС‹ С€Р»Рё С†РµР»С‹Р№ РіРѕРґ", РґРѕР±Р°РІР»РµС‚ РѕРЅР°. РџРµСЃРЅСЋ, РєРѕС‚РѕСЂСѓСЋ Р�РѕР°РЅР° РёСЃРїРѕР»РЅРёС‚ РЅР° Р•РІСЂРѕРІРёРґРµРЅРёРё РѕРЅР° РЅР°РїРёСЃР°Р»Р° СЃР°РјР°. Р’ РґРѕРїРѕР»РЅРµРЅРёРё Рє РјСѓР·С‹РєРµ Р±С‹Р»Рѕ РїСЂРёРіРѕС‚РѕРІР»РµРЅРѕ РєСЂР°СЃРёРІРѕРµ С€РѕСѓ. "РЎРѕ РјРЅРѕР№ РЅР° СЃС†РµРЅРµ Р±СѓРґРµС‚ 5 С‚Р°РЅС†РѕРІС‰РёС† РёР· РіСЂСѓРїРїС‹ "Future M&Q" РёР· РћСЂР°РґРёРё (Ivana Farc, Cristina Pandrea, Alexandra Sabau, Andreea Margin and Diana Pacurar). Р­С‚Рѕ РїСЂРµРєСЂР°СЃРЅС‹Рµ РґРµРІРѕС‡РєРё. РҐРѕС‚СЏ РјС‹ РёР· СЂР°Р·РЅС‹С… РіРѕСЂРѕРґРѕРІ, РЅРѕ РјС‹ СѓР¶Рµ РјРЅРѕРіРѕ СЂР°Р· РІСЃС‚СЂРµС‡Р°Р»РёСЃСЊ РЅР° СЂР°Р·Р»РёС‡РЅС‹С… РєРѕРЅРєСѓСЂСЃР°С…. РћС‡РµРЅСЊ РјРЅРѕРіРёРµ С…РІР°Р»СЏС‚ РЅР°С€Рµ РІС‹СЃС‚СѓРїР»РµРЅРёРµ", РѕС‚РјРµС‡Р°Р»Р° Р�РѕР°РЅР°. "РўРµРїРµСЂСЊ РјС‹ РѕС‚РїСЂР°РІРёРјСЃСЏ РІ РљРёРµРІ, С‡С‚РѕР±С‹ РїРѕР±РµРґРёС‚СЊ! ", Р·Р°СЏРІРёР»Р° РѕРЅР°. Р–РёС‚РµР»Рё РіРѕСЂРѕРґР° РЎР»Р°С‚РёРЅР° СЂР°Р·РІРµСЃРёР»Рё РїРѕ СѓР»РёС†Р°Рј РїР»Р°РєР°С‚С‹, РїСЂРёР·С‹РІР°СЋС‰РёРµ РїРѕРґРґРµСЂР¶Р°С‚СЊ СЋРЅСѓСЋ РїРµРІРёС†Сѓ. "РњС‹ СЃ РЅРµР№. Р’РїРµСЂРІС‹Рµ РЅР°С€ СЃС‚СѓРґРµРЅС‚ РґРѕР±РёР»СЃСЏ С‚Р°РєРѕРіРѕ СѓСЃРїРµС…Р°. РњС‹ РµСЋ РіРѕСЂРґРёРјСЃСЏ. Р� СѓС‡РёС‚РµР»СЏ Рё СѓС‡РµРЅРёРєРё Р±СѓРґСѓС‚ РіРѕР»РѕСЃРѕРІР°С‚СЊ Р·Р° Р�РѕР°РЅСѓ", РіРѕРІРѕСЂРёС‚ Р�Р»РёСѓС‚Р° Р‘СЂР°РёР»СЏРЅСѓ, РґРёСЂРµРєС‚РѕСЂ РјРµСЃС‚РЅРѕРіРѕ Р”РІРѕСЂС†Р° РЁРєРѕР»СЊРЅРёРєРѕРІ. РљР°Рє РѕР±С‹С‡РЅРѕ, РєРѕРјРјРµРЅС‚Р°С‚РѕСЂР°РјРё СЂСѓРјС‹РЅСЃРєРѕРіРѕ С‚РµР»РµРІРёРґРµРЅРёСЏ РЅР° РєРѕРЅРєСѓСЂСЃРµ СЃС‚Р°РЅСѓС‚ Р�РѕР°РЅР° Р�СЃРѕРїРµСЃРєСѓ Рё РђР»РµРєСЃР°РЅРґСЂ РќР°РіСЊ (РєРѕРјРјРµРЅС‚Р°С‚РѕСЂС‹ РІСЃРµС… РїСЂРµРґС‹РґСѓС‰РёС… РєРѕРЅРєСѓСЂСЃРѕРІ), Р° СЂРµР·СѓР»СЊС‚Р°С‚С‹ РіРѕР»РѕСЃРѕРІР°РЅРёСЏ РѕР±СЉСЏРІРёС‚ Р®Р»РёСЏ Р§РѕР±Р°РЅСѓ, РєРѕС‚РѕСЂР°СЏ РґРµР»Р°Р»Р° СЌС‚Рѕ РІ РїРѕСЃР»РµРґРЅРёРµ РґРІР° РіРѕРґР°. Orice-ar fi nu da Г®napoi! No matter what, look forward! 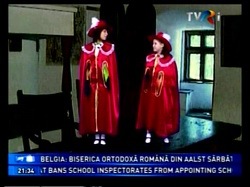 - Hello, Ioana, and first of all our congratulations for winning Romanian national selection! What were your first thoughts when you realized you are the winner of the competition? - Hello! And thank you for congratulating me. My first thoughts directed to God, to whom I thanked for having rewarded so nicely the work I`ve done... Of course I thought at my family too and at the teachers who prepared me for this contest. - My name is Ioana Bianca Anuta. I am 15, I live in Slatina - Romania, I am student of the National College "Ion Minulescu"in the nineth grade, and I`ve got a great passion - music. - I always sing in my mind , but for sometime I`ve been obsessed with a musical theme that I used to sing... As I am a merry person and I like smiling, playing and enjoying every moment of my life, I thought I should write some lyrics on this theme...I think that people would be much richer if they smiled more...Just as my song started:"Come and try to smile..."
- Can you describe the message of the song for those, who donвЂ™t understand Romanian? - The message of my song is very generous and it is about everything that we can do. It is addressed to kids, and teenagers, as well as to adults: everyone has the power in their hand in order to become a better person, to make their life and the others better or to make the Earth become a better place ... Each of us must follow own dreams and fight against the difficulties, come over their limits and fight against all kinds of addictions. - Who is your vocal coach and choreographer of your entry? - The girls that dance with me are the same age as me, we are very good friends and we make up an excellent team. Their names are: Diana, Ivana, Cristina, Andreea and Alexandra. - How will you visually present your entry on stage? Will it be similar performance as during Romanian national final, or is there plan to add any visual effects for the international audience to understand better your song? - We are working intensly for the contest , for the scene appearance, togheter with the dancers as well as for my voice (canto lessons). - Can you tell us, how looks your basic day? What activities do you usually have? How do you spend your leasure time? 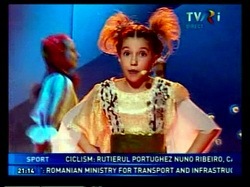 - Have you met any previous Romanian JESC entrants? Any advices they gave to you? - Do you have some favourite entries from the past year of Junior Eurovision? - My favourite entry from the past year of Junior Eurovision is Georgia team - Bzikebi. - Are you interested to find who will represent other countries in competition, will you listen to the other competing entries prior to departure to Kyiv? - What is your aim for the competition? 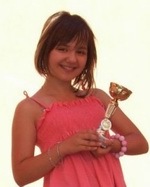 - What was your biggest music achievement so far, besides winning JESC preselection? 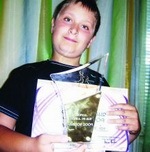 - This year I won two of biggest children singing contests in Romania : the first place at "Junior Golden Stag - 2009" and the second place at "Mamaia Copiilor -2009". - Do you like contests and to compete in general? What other festivals you took part in? - I usually like going to singing contests and competing. I also took part in: "Remember 2009", "Stelele Dunarii 2009", "Coloana infinitului 2009", "Potaissa 2008", "Flori de mai 2008", "Portativul veseliei 2009", "Suflet de stea 2008/2009", "Micul artist 2008", "Ursuletul de aur 2008", "Un talent innascut 2008/2009", "Star musik 2008", etc. - What are your plans after the contest? Do you want to become professional singer in future? - I do hope the atmosphere in Kiev will be special, I also hope that I can make many friends there and that my show will be watched with interest by many people. - Thank you too....See you there ! - РџСЂРёРІРµС‚, Р�РѕР°РЅР°! РќР°С€Рё РїРѕР·РґСЂР°РІР»РµРЅРёСЏ СЃ РїРѕР±РµРґРѕР№ РЅР° СЂСѓРјС‹РЅСЃРєРѕРј РѕС‚Р±РѕСЂРµ! РљР°РєРёРµ Р±С‹Р»Рё С‚РІРѕРё РїРµСЂРІС‹Рµ РјС‹СЃР»Рё, РєРѕРіРґР° С‚С‹ РїРѕРЅСЏР»Р°, С‡С‚Рѕ СЃС‚Р°Р»Р° РїРѕР±РµРґРёС‚РµР»СЊРЅРёС†РµР№? - РџСЂРёРІРµС‚! РЎРїР°СЃРёР±Рѕ Р·Р° РїРѕР·РґСЂР°РІР»РµРЅРёСЏ. РњРѕРё РїРµСЂРІС‹Рµ РјС‹СЃР»Рё Р±С‹Р»Рё РѕР±СЂР°С‰РµРЅС‹ Рє Р‘РѕРіСѓ, РєРѕС‚РѕСЂРѕРіРѕ СЏ РїРѕР±Р»Р°РіРѕРґР°СЂРёР»Р° Р·Р° С‚Рѕ, С‡С‚Рѕ РѕРЅ С‚Р°Рє РЅР°РіСЂР°РґРёР» РјРµРЅСЏ Р·Р° РІСЃСЋ РїСЂРѕРґРµР»Р°РЅРЅСѓСЋ СЂР°Р±РѕС‚Сѓ... РљРѕРЅРµС‡РЅРѕ, СЏ РїРѕРґСѓРјР°Р»Р° Рё Рѕ СЃРІРѕРµР№ СЃРµРјСЊРµ Рё Рѕ РјРѕРёС… СѓС‡РёС‚РµР»СЏС…, РєРѕС‚РѕСЂС‹Рµ РїРѕРјРѕРіР°Р»Рё РјРЅРµ РїРѕРґРіРѕС‚РѕРІРёС‚СЊСЃСЏ Рє РєРѕРЅРєСѓСЂСЃСѓ. - РџСЂРµРґСЃС‚Р°РІСЊ СЃРµР±СЏ РЅР°С€РёРј С‡РёС‚Р°С‚РµР»СЏРј РІ РѕРґРЅРѕРј РїСЂРµРґР»РѕР¶РµРЅРёРё? - РњРµРЅСЏ Р·РѕРІСѓС‚ Р�РѕР°РЅР° Р‘СЊСЏРЅРєР° РђРЅСѓС†Р°, РјРЅРµ 15 Р»РµС‚, СЏ Р¶РёРІСѓ РІ РЎР»Р°С‚РёРЅРµ РІ Р СѓРјС‹РЅРёРё Рё СѓС‡СѓСЃСЊ РІ РЅР°С†РёРѕРЅР°Р»СЊРЅРѕРј РєРѕР»Р»РµРґР¶Рµ "Р�РѕРЅ РњРёРЅСѓР»РµСЃРєСѓ" РІ 9Рј РєР»Р°СЃСЃРµ, Рё РјРѕР№ СЃР°РјС‹Р№ Р±РѕР»СЊС€РѕР№ РёРЅС‚РµСЂРµСЃ РІ Р¶РёР·РЅРё - СЌС‚Рѕ РјСѓР·С‹РєР°. - Р Р°СЃСЃРєР°Р¶Рё РЅР°Рј, РєР°Рє СЃРѕР·РґР°РІР°Р»Р°СЃСЊ С‚РІРѕСЏ РїРµСЃРЅСЏ? - РЇ РІСЃРµРіРґР° РїРѕСЋ РІ РјС‹СЃР»СЏС…, Рё РєР°РєРѕРµ-С‚Рѕ РІСЂРµРјСЏ РјРµРЅСЏ РїСЂРµСЃР»РµРґРѕРІР°Р»Р° РјСѓР·С‹РєР°Р»СЊРЅР°СЏ С‚РµРјР°, РєРѕС‚РѕСЂСѓСЋ СЏ РЅР°РїРµРІР°Р»Р°. РЇ РІРѕРѕР±С‰Рµ РѕРїС‚РёРјРёСЃС‚РёС‡РЅС‹Р№ С‡РµР»РѕРІРµРє - Р»СЋР±Р»СЋ СѓР»С‹Р±Р°С‚СЊСЃСЏ, РёРіСЂР°С‚СЊ Рё РїРѕР»СѓС‡Р°С‚СЊ СѓРґРѕРІРѕР»СЊСЃС‚РІРёРµ РѕС‚ РєР°Р¶РґРѕРіРѕ РјРѕРјРµРЅС‚Р° СЃРІРѕРµР№ Р¶РёР·РЅРё, Рё СЏ РїРѕРґСѓРјР°Р»Р°, С‡С‚Рѕ Р±С‹Р»Рѕ Р±С‹ РЅРµРїР»РѕС…Рѕ РЅР°РїРёСЃР°С‚СЊ СЃР»РѕРІР° РЅР° СЌС‚Сѓ РјРµР»РѕРґРёСЋ... РЇ СЂРµС€РёР»Р°, С‡С‚Рѕ Р»СЋРґРё РјРѕРіСѓС‚ СЃС‚Р°С‚СЊ РґСѓС…РѕРІРЅРѕ Р±РѕРіР°С‡Рµ, РµСЃР»Рё РѕРЅРё Р±СѓРґСѓС‚ Р±РѕР»СЊС€Рµ СѓР»С‹Р±Р°С‚СЊСЃСЏ... РўР°Рє Рё РЅР°С‡РёРЅР°РµС‚СЃСЏ РјРѕСЏ РїРµСЃРЅСЏ - "Р”Р°РІР°Р№С‚Рµ, РїРѕРїСЂРѕР±СѓР№С‚Рµ СѓР»С‹Р±РЅСѓС‚СЊСЃСЏ...". - РњРѕР¶РµС€СЊ Р»Рё С‚С‹ РѕРїРёСЃР°С‚СЊ РјРµСЃСЃРµРґР¶ СЃРІРѕРµР№ РїРµСЃРЅРё РґР»СЏ С‚РµС…, РєС‚Рѕ РЅРµ РїРѕРЅРёРјР°РµС‚ СЂСѓРјС‹РЅСЃРєРѕРіРѕ? - РњРµСЃСЃРµРґР¶ РјРѕРµР№ РїРµСЃРЅРё Рѕ С‚РѕРј, С‡С‚Рѕ РјС‹ РІСЃРµ РјРѕР¶РµРј СЃРґРµР»Р°С‚СЊ, РѕРЅР° Р°РґСЂРµСЃРѕРІР°РЅР° РєР°Рє Рє РґРµС‚СЏРј, РїРѕРґСЂРѕСЃС‚РєР°Рј, С‚Р°Рє Рё РєРѕ РІР·СЂРѕСЃР»С‹Рј: Сѓ РІСЃРµС… РµСЃС‚СЊ РІ СЂСѓРєР°С… СЃРёР»Р°, С‡С‚РѕР±С‹ РёР·РјРµРЅРёС‚СЊСЃСЏ Рє Р»СѓС‡С€РµРјСѓ, РёР·РјРµРЅРёС‚СЊ СЃРІРѕСЋ Р¶РёР·РЅСЊ Рё Р¶РёР·РЅСЊ РѕРєСЂСѓР¶Р°СЋС‰РёС… Рё СЃРґРµР»Р°С‚СЊ Р—РµРјР»СЋ Р±РѕР»РµРµ Р»СѓС‡С€РёРј РјРµСЃС‚РѕРј... РљР°Р¶РґС‹Р№ РёР· РЅР°СЃ РґРѕР»Р¶РµРЅ СЃР»РµРґРѕРІР°С‚СЊ Р·Р° СЃРІРѕРµР№ РјРµС‡С‚РѕР№ Рё Р±РѕСЂРѕС‚СЊСЃСЏ СЃРѕ СЃР»РѕР¶РЅРѕСЃС‚СЏРјРё, РїСЂРµРѕРґРѕР»РµРІР°С‚СЊ РїСЂРµРїСЏС‚СЃС‚РІРёСЏ Рё Р±РѕСЂРѕС‚СЊСЃСЏ СЃ СЂР°Р·Р»РёС‡РЅС‹РјРё РЅР°РїР°СЃС‚СЏРјРё. - РљС‚Рѕ СЂР°Р±РѕС‚Р°РµС‚ СЃ С‚РѕР±РѕР№ РєР°Рє РїРµРґР°РіРѕРі Рё С…РѕСЂРµРѕРіСЂР°С„ С‚РІРѕРµР№ РїРµСЃРЅРё? - РњРѕР¶РµС€СЊ РїСЂРµРґСЃС‚Р°РІРёС‚СЊ С‚РµС…, РєС‚Рѕ СЃРѕРїСЂРѕРІРѕР¶РґР°РµС‚ С‚РµР±СЏ РІ РІС‹СЃС‚СѓРїР»РµРЅРёРё? - Р­С‚Рё РґРµРІРѕС‡РєРё РѕРґРЅРѕРіРѕ СЃРѕ РјРЅРѕР№ РІРѕР·СЂР°СЃС‚Р°, РјС‹ С…РѕСЂРѕС€РёРµ РґСЂСѓР·СЊСЏ Рё, РґСѓРјР°СЋ, РёР· РЅР°СЃ РїРѕР»СѓС‡РёР»Р°СЃСЊ РѕС‚Р»РёС‡РЅР°СЏ РєРѕРјР°РЅРґР°. Р�С… Р·РѕРІСѓС‚ Р”РёР°РЅР°, Р�РІР°РЅР°, РљСЂРёСЃС‚РёРЅР°, РђРЅРґСЂРµР° Рё РђР»РµРєСЃР°РЅРґСЂР°. - РљР°Рє РІРёР·СѓР°Р»СЊРЅРѕ Р±СѓРґРµС‚ РїСЂРµРґСЃС‚Р°РІР»РµРЅР° РїРµСЃРЅСЏ РЅР° СЃС†РµРЅРµ? Р‘СѓРґСѓС‚ РёР·РјРµРЅРµРЅРёСЏ РїРѕ СЃСЂР°РІРЅРµРЅРёСЋ СЃ РЅР°С†РёРѕРЅР°Р»СЊРЅС‹Рј РєРѕРЅРєСѓСЂСЃРѕРј? - РљР°РєРёРµ С‚РІРѕРё РїР»Р°РЅС‹ РїРѕРґРіРѕС‚РѕРІРєРё Рє РєРѕРЅРєСѓСЂСЃСѓ? - РњС‹ РёРЅС‚РµРЅСЃРёРІРЅРѕ СЂР°Р±РѕС‚Р°РµРј, РєР°Рє РЅР°Рґ СЃС†РµРЅРёС‡РµСЃРєРѕРјРё РІС‹СЃС‚СѓРїР»РµРЅРёРµРј РІРјРµСЃС‚Рµ СЃ РјРѕРёРјРё С‚Р°РЅС†РѕСЂР°РјРё, С‚Р°Рє Рё РЅР°Рґ РјРѕРёРј РІРѕРєР°Р»РѕРј. - Р Р°СЃСЃРєР°Р¶Рё РЅР°Рј, РєР°Рє РІС‹РіР»СЏРґРёС‚ С‚РІРѕР№ РѕР±С‹С‡РЅС‹Р№ РґРµРЅСЊ, С‡РµРј С‚С‹ РѕР±С‹С‡РЅРѕ Р·Р°РЅРёРјР°РµС€СЊСЃСЏ, РєР°Рє РїСЂРѕРІРѕРґРёС€СЊ СЃРІРѕР±РѕРґРЅРѕРµ РІСЂРµРјСЏ? - РљР°РєРёРµ С‚РІРѕРё Р»СЋР±РёРјС‹Рµ РїСЂРµРґРјРµС‚С‹ РІ С€РєРѕР»Рµ? - Р’СЃС‚СЂРµС‡Р°Р»Р°СЃСЊ Р»Рё С‚С‹ СЃ РїСЂРµРґСЃС‚Р°РІРёС‚РµР»СЏРјРё Р СѓРјС‹РЅРёРё РїСЂРѕС€Р»С‹С… Р»РµС‚? Р”Р°РІР°Р»Рё Р»Рё РѕРЅРё С‚РµР±Рµ РєР°РєРёРµ-С‚Рѕ СЃРѕРІРµС‚С‹? - Р•СЃС‚СЊ Р»Рё РїРµСЃРЅСЏ, РєРѕС‚РѕСЂР°СЏ РІ РїСЂРѕС€Р»С‹Рµ РіРѕРґС‹ С‚РµР±Рµ РїРѕРЅСЂР°РІРёР»Р°СЃСЊ РЅР° Р•РІСЂРѕРІРёРґРµРЅРёРё Р±РѕР»СЊС€Рµ РІСЃРµРіРѕ? - Р”Р°, РІ РїСЂРѕС€Р»РѕРј РіРѕРґСѓ РјРЅРµ РѕСЃРѕР±РµРЅРЅРѕ РїРѕРЅСЂР°РІРёР»РёСЃСЊ РїРѕР±РµРґРёС‚РµР»Рё РёР· Р“СЂСѓР·РёРё - Bzikebi. - Р�РЅС‚РµСЂРµСЃРЅРѕ Р»Рё С‚РµР±Рµ, РєС‚Рѕ РїСЂРµРґСЃС‚Р°РІРёС‚ РґСЂСѓРіРёРµ СЃС‚СЂР°РЅС‹ РЅР° РєРѕРЅРєСѓСЂСЃРµ, Р±СѓРґРµС€СЊ Р»Рё С‚С‹ СЃР»СѓС€Р°С‚СЊ СѓС‡Р°СЃС‚РІСѓСЋС‰РёРµ РїРµСЃРЅРё РґРѕ РїРѕРµР·РґРєРё РІ РљРёРµРІ? - РљР°РєСѓСЋ С†РµР»СЊ С‚С‹ СЃС‚Р°РІРёС€СЊ РїРµСЂРµРґ СЃРѕР±РѕР№ РЅР° РєРѕРЅРєСѓСЂСЃРµ Р”РµС‚СЃРєРѕРµ Р•РІСЂРѕРІРёРґРµРЅРёРµ? - РљР°РєРѕРµ С‚РІРѕРµ РЅР°РёРІС‹СЃС€РµРµ РґРѕСЃС‚РёР¶РµРЅРёРµ РїРѕРјРёРјРѕ Р•РІСЂРѕРІРёРґРµРЅРёСЏ? - Р’ СЌС‚РѕРј РіРѕРґСѓ СЏ РїРѕР±РµРґРёР»Р° РЅР° РґРІСѓС… РєСЂСѓРїРЅРµР№С€РёС… РјСѓР·С‹РєР°Р»СЊРЅС‹С… РєРѕРЅРєСѓСЂСЃР°С… РІ Р СѓРјС‹РЅРёРё: Р·Р°РІРѕРµРІР°Р»Р° РїРµСЂРІРѕРµ РјРµСЃС‚Рѕ РЅР° "Junior Golden Stag 2009" Рё РІС‚РѕСЂРѕРµ РјРµСЃС‚Рѕ РЅР° "Mamaia Copiilor 2009". - РўРµР±Рµ РІРѕРѕР±С‰Рµ РЅСЂР°РІРёС‚СЃСЏ СѓС‡Р°СЃС‚РІРѕРІР°С‚СЊ РІ РєРѕРЅРєСѓСЂСЃР°С…? Р’ РєР°РєРёС… РµС‰Рµ С„РµСЃС‚РёРІР°Р»СЏС… С‚С‹ РїСЂРёРЅРёРјР°Р»Р° СѓС‡Р°СЃС‚РёРµ? - РњРЅРµ РѕР±С‹С‡РЅРѕ РЅСЂР°РІРёС‚СЃСЏ РїРµС‚СЊ РІ РєРѕРЅРєСѓСЂСЃР°С…. 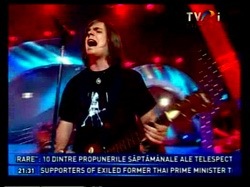 РЇ РІС‹СЃС‚СѓРїР°Р»Р° РІ "Remember 2009", "Stelele Dunarii 2009", "Coloana infinitului 2009", "Potaissa 2008", "Flori de mai 2008", "Portativul veseliei 2009", "Suflet de stea 2008/2009", "Micul artist 2008", "Ursuletul de aur 2008", "Un talent innascut 2008/2009", "Star musik 2008" Рё РґСЂСѓРіРёС…. - РљР°РєСѓСЋ РјСѓР·С‹РєСѓ С‚С‹ РѕР±С‹С‡РЅРѕ СЃР»СѓС€Р°РµС€СЊ? РљС‚Рѕ С‚РІРѕРё Р»СЋР±РёРјС‹Рµ СЂСѓРјС‹РЅСЃРєРёРµ Рё Р·Р°СЂСѓР±РµР¶РЅС‹Рµ РёСЃРїРѕР»РЅРёС‚РµР»Рё? - РљР°РєРёРµ С‚РІРѕРё РїР»Р°РЅС‹ РїРѕСЃР»Рµ РєРѕРЅРєСѓСЂСЃР°? РўС‹ С…РѕС‡РµС€СЊ СЃС‚Р°С‚СЊ РІ Р±СѓРґСѓС‰РµРј РїСЂРѕС„РµСЃСЃРёРѕРЅР°Р»СЊРЅРѕР№ РїРµРІРёС†РµР№? - Р•СЃР»Рё Сѓ С‚РµР±СЏ РµСЃС‚СЊ С‡С‚Рѕ-С‚Рѕ РґРѕР±Р°РІРёС‚СЊ С‡РёС‚Р°С‚РµР»СЏРј, С‚С‹ РјРѕР¶РµС€СЊ СЌС‚Рѕ СЃРґРµР»Р°С‚СЊ СЃРµР№С‡Р°СЃ. - РЇ РЅР°РґРµСЋСЃСЊ, С‡С‚Рѕ Р°С‚РјРѕСЃС„РµСЂР° РІ РљРёРµРІРµ Р±СѓРґРµС‚ РѕСЃРѕР±РµРЅРЅРѕР№, С‡С‚Рѕ СЏ СЃРјРѕРіСѓ РїРѕРґСЂСѓР¶РёС‚СЊСЃСЏ СЃ РґСЂСѓРіРёРјРё РёСЃРїРѕР»РЅРёС‚РµР»СЏРјРё, Рё С‡С‚Рѕ Р·Р° РјРѕРёРј РІС‹СЃС‚СѓРїР»РµРЅРёРµРј СЃ РёРЅС‚РµСЂРµСЃРѕРј Р±СѓРґСѓС‚ СЃР»РµРґРёС‚СЊ РјРЅРѕРіРѕ Р·СЂРёС‚РµР»РµР№. - РЎРїР°СЃРёР±Рѕ Р·Р° РёРЅС‚РµСЂРІСЊСЋ Рё СѓРІРёРґРёРјСЃСЏ РІ РљРёРµРІРµ! - РЎРїР°СЃРёР±Рѕ Рё РІР°Рј... СѓРІРёРґРёРјСЃСЏ С‚Р°Рј! 27/10 Romania entrant Ioana Anuta keeps on her preparations for the Junior Eurovision Song Contest. Few days ago she has been granted financial support from the local city council in the amount of 30000 leu (7000 Euros). The money will be used to cover transport, accommodation, meals and costumes, the team that will help Ioana Anuta, both during training in Bucharest and in Kiev, Ukraine. On 14th of November Ioana will depart for Kiev and this Saturday she together with her parents and backing dancers traveled for a short tour to village of Uzdin, situated in Serbia just 80 km from Romanian border. 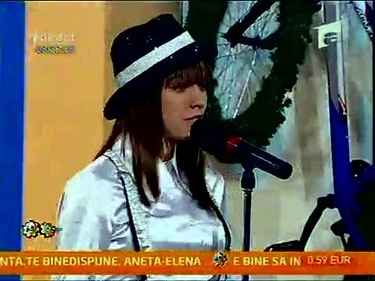 Here she gave press-conference, which was attended by Serbian television and performed for the Romanian community there. "It was something impressive. 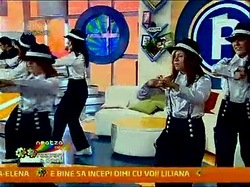 Romanians already knew the lyrics and melody of Ioana's entry and sang together with her. Also, they promised to vote for a song. We had an exceptional reception and show that took over an hour. We returned to Slatina on Sunday evening. Now, we will get ready for the show in Kiev, Ukraine. In Kiev Ioana will be accompanied by her backing dancers, her vocal coach Crina Mardare, choreographer, team of Romanian television and my wife, hope I may also get there, all in all there will be around 15 people", told Gazeta Oltului father of Ioana, Marius Anuta. "The other day it was announced that local council will provide us financial support. We're very glad that Slatina Municipality supports us and helps us. However, the costs of moving to Kiev come close to 100,000 lei". РџСЂРµРґСЃС‚Р°РІРёС‚РµР»СЊРЅРёС†Р° Р СѓРјС‹РЅРёРё Р�РѕР°РЅР° РђРЅСѓС†Р° РїСЂРѕРґРѕР»Р¶Р°РµС‚ СЃРІРѕСЋ РїРѕРґРіРѕС‚РѕРІРєСѓ Рє Р”РµС‚СЃРєРѕРјСѓ Р•РІСЂРѕРІРёРґРµРЅРёСЋ. РќРµСЃРєРѕР»СЊРєРѕ РґРЅРµР№ РЅР°Р·Р°Рґ РµР№ Р±С‹Р»Р° РІС‹РґРµР»РµРЅР° С„РёРЅР°РЅСЃРѕРІР°СЏ РїРѕРґРґРµСЂР¶РєР° СЃРѕ СЃС‚РѕСЂРѕРЅС‹ РјСЌСЂРёРё РµРµ СЂРѕРґРЅРѕРіРѕ РіРѕСЂРѕРґР° РІ СЃСѓРјРјРµ 30000 Р»РµРµРІ (7000 РµРІСЂРѕ). Р­С‚Рё РґРµРЅСЊРіРё РїРѕР№РґСѓС‚ РЅР° РїРѕРєСЂС‹С‚РёРµ СЂР°СЃС…РѕРґРѕРІ С‚СЂР°РЅСЃРїРѕСЂС‚Р°, РїСЂРѕР¶РёРІР°РЅРёСЏ, РїРёС‚Р°РЅРёСЏ Рё РєРѕСЃС‚СЋРјРѕРІ РґР»СЏ РєРѕРјР°РЅРґС‹, РєРѕС‚РѕСЂР°СЏ Р±СѓРґРµС‚ РїРѕРјРѕРіР°С‚СЊ Р�РѕР°РЅРµ, РєР°Рє РЅР° СЂРµРїРµС‚РёС†РёСЏС… РІ Р‘СѓС…Р°СЂРµСЃС‚Рµ, С‚Р°Рє Рё РІ РїРѕРµР·РґРєРµ РІ РљРёРµРІ. 14РіРѕ РЅРѕСЏР±СЂСЏ Р�РѕР°РЅР° РѕС‚РїСЂР°РІРёС‚СЃСЏ РІ СЃС‚РѕР»РёС†Сѓ РЈРєСЂР°РёРЅС‹, Р° РІ СЌС‚Сѓ СЃСѓР±Р±РѕС‚Сѓ РѕРЅР°, РІРјРµСЃС‚Рµ СЃРѕ СЃРІРѕРёРјРё СЂРѕРґРёС‚РµР»СЏРјРё Рё С‚Р°РЅС†РѕСЂР°РјРё РѕС‚РїСЂР°РІРёР»Р°СЃСЊ РІ РєРѕСЂРѕС‚РєРёР№ С‚СѓСЂ РІ РґРµСЂРµРІРЅСЋ РЈР·РґРёРЅ, СЂР°СЃРїРѕР»РѕР¶РµРЅРЅСѓСЋ РІ РЎРµСЂР±РёРё РІСЃРµРіРѕ РІ 80 РєРёР»РѕРјРµС‚СЂР°С… РѕС‚ РіСЂР°РЅРёС†С‹ СЃ Р СѓРјС‹РЅРёРµР№. РўР°Рј РѕРЅР° РґР°Р»Р° РїСЂРµСЃСЃ-РєРѕРЅС„РµСЂРµРЅС†РёСЋ, РєРѕС‚РѕСЂСѓСЋ РїРѕСЃРµС‚РёР»Рѕ РўРµР»РµРІРёРґРµРЅРёРµ РЎРµСЂР±РёРё Рё РІС‹СЃС‚СѓРїРёР»Р° РґР»СЏ Р¶РёС‚РµР»РµР№ Р СѓРјС‹РЅСЃРєРѕР№ РґРёР°СЃРїРѕСЂС‹. "Р­С‚Рѕ Р±С‹Р»Рѕ РІРїРµС‡Р°С‚Р»СЏСЋС‰Рµ. РњРµСЃС‚РЅС‹Рµ СЂСѓРјС‹РЅС‹ СѓР¶Рµ Р·РЅР°Р»Рё С‚РµРєСЃС‚ Рё РјРµР»РѕРґРёСЋ РїРµСЃРЅРё Р�РѕР°РЅС‹ Рё РїРѕРґРїРµРІР°Р»Рё РµР№. РћРЅРё С‚Р°РєР¶Рµ РїРѕРѕР±РµС‰Р°Р»Рё РїСЂРѕРіРѕР»РѕСЃРѕРІР°С‚СЊ Р·Р° РµРµ РїРµСЃРЅСЋ. РќР°СЃ РїСЂРµРєСЂР°СЃРЅРѕ РїСЂРёРЅРёРјР°Р»Рё Рё С€РѕСѓ РїСЂРѕРґРѕР»Р¶Р°Р»РѕСЃСЊ РѕРєРѕР»Рѕ С‡Р°СЃР°. Р’ РІРѕСЃРєСЂРµСЃРµРЅСЊРµ РІРµС‡РµСЂРѕРј РјС‹ РІРµСЂРЅСѓР»РёСЃСЊ РІ РЎР»Р°С‚РёРЅСѓ. РЎРµР№С‡Р°СЃ РјС‹ РїСЂРѕРґРѕР»Р¶Р°РµРј РїРѕРґРіРѕС‚РѕРІРєСѓ Рє С€РѕСѓ РІ РљРёРµРІРµ. Р’ РљРёРµРІ Р�РѕР°РЅР° РїРѕРµРґРµС‚ СЃРѕ СЃРІРѕРёРјРё С‚Р°РЅС†РѕСЂР°РјРё, РїРµРґР°РіРѕРіРѕРј РїРѕ РІРѕРєР°Р»Сѓ РљСЂРёРЅРѕР№ РњР°СЂРґР°СЂРµ, С…РѕСЂРµРѕРіСЂР°С„РѕРј, РєРѕРјР°РЅРґРѕР№ СЂСѓРјС‹РЅСЃРєРѕРіРѕ С‚РµР»РµРІРёРґРµРЅРёСЏ Рё РјРѕРµР№ Р¶РµРЅРѕР№, РЅР°РґРµСЋСЃСЊ, С‡С‚Рѕ Рё СЏ СЃР°Рј СЃРјРѕРіСѓ СЃРѕРїСЂРѕРІРѕР¶РґР°С‚СЊ Р�РѕР°РЅСѓ, РІСЃРµРіРѕ Р±СѓРґРµС‚ РѕРєРѕР»Рѕ 15 Р»СЋРґРµР№", СЂР°СЃСЃРєР°Р·Р°Р» РјРµСЃС‚РЅРѕР№ РїСЂРµСЃСЃРµ РѕС‚РµС† Р�РѕР°РЅС‹ РњР°СЂРёСѓС€ РђРЅСѓС†Р°. "РќРµРґР°РІРЅРѕ, РЅР°Рј РѕР±СЉСЏРІРёР»Рё Рѕ С‚РѕРј, С‡С‚Рѕ РјСЌСЂРёСЏ РІС‹РґРµР»РёС‚ РЅР°Рј С„РёРЅР°РЅСЃРѕРІСѓСЋ РїРѕРґРґРµСЂР¶РєСѓ. РњС‹ РѕС‡РµРЅСЊ СЂР°РґС‹ С‚РѕРјСѓ, С‡С‚Рѕ РјСѓРЅРёС†РёРїР°Р»РёС‚РµС‚ РЎР»Р°С‚РёРЅС‹ РїРѕРґРґРµСЂР¶РёРІР°РµС‚ Рё РїРѕРјРѕРіР°РµС‚ РЅР°Рј. РџСЂР°РІРґР°, РЅР°С€Рё СЂР°СЃС…РѕРґС‹ РЅР° РїРѕРµР·РґРєСѓ РІ РљРёРµРІ СЃРѕСЃС‚Р°РІСЏС‚ РѕРєРѕР»Рѕ 100 000 Р»РµРµРІ". 10/10 Romanian television has produced a preview video for it's contest entry "Ai puterea in mana ta" performed by Ioana Anuta. 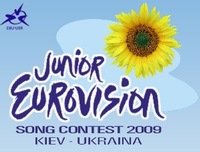 It is the first of preview videos that have been presented for JESC 2009 season. Presentation of couple of more videos is scheduled to take place next week, along with Heads of Delegations meeting. РўРµР»РµРІРёРґРµРЅРёРµ Р СѓРјС‹РЅРёРё РІС‹РїСѓСЃС‚РёР»Рѕ РїСЂРµРІСЊСЋ РєР»РёРї РЅР° РєРѕРЅРєСѓСЂСЃРЅСѓСЋ РїРµСЃРЅСЋ "Ai puterea in mana ta" РІ РёСЃРїРѕР»РЅРµРЅРёРё Р�РѕР°РЅС‹ РђРЅСѓС†С‹. Р­С‚Рѕ РїРµСЂРІС‹Р№ РІРёРґРµРѕРєР»РёРї РёР· СЃРµСЂРёРё РїСЂРµРІСЊСЋ СЃРµР·РѕРЅР° 2009, РїСЂРµРґСЃС‚Р°РІР»РµРЅРЅС‹Р№ РїСѓР±Р»РёРєРµ. РџСЂРµР·РµРЅС‚Р°С†РёСЏ РµС‰Рµ РЅРµСЃРєРѕР»СЊРєРёС… РІРёРґРµРѕ РѕР¶РёРґР°РµС‚СЃСЏ РЅР° СЃР»РµРґСѓСЋС‰РµР№ РЅРµРґРµР»Рµ, РїРѕСЃР»Рµ РІСЃС‚СЂРµС‡Рё РіР»Р°РІ РґРµР»РµРіР°С†РёР№. Select Eurovision Junior 2009 part I or part II in drop down menu "Inregistrari" and then select Real Player or Flash Player. 25/08 Updated: Big interest has surrounded announcements of the names of finalists of Romanian Junior Eurovision preselection. As all participating artists can already be considered themselves as famous persons, having won numerous trophies of the national and international music contests, singers, their families and fans keep high hopes for a success in a local "Eurovision Junior". "The fact that I have qualified to the final is one of the greatest achievements in my career. I have chosen song "Legend of Sanziene fairies" because I wanted to tell a story, based on Romanian traditions. Through participation in this contest I want to promote our traditions, customs and Romanian legends", says Georgiana Blagescu to Adevarul. Georgiana's entry has also got support from ESC 2006 entrant Mihai Traistariu: "From my point of view, this song is the best one of all those present in the national selection and is interpreted by an exceptional voice", said singer. Day of NF is Georgiana's 14th birthday. "I'm very much nervous, but as I want to fulfil my dream I have to control myself. We have been working very hard to prepare for the contest, I have written the song "The circus comes to the town" and together with my family we have staged the presentation and designed outfits. For the rehearsals I have to travel twice a week to the Bucharest. If I will succeed in the preselection, I will make sure to get the big trophy to Mioveni in November", promises Ion Moise Badulescu in interview to Courieru. Ioana Anuta admits that to win national preselection one has to create a real show on stage. "In addition to singing classes, I have to spend hours on practicing choreography for the stage performance. I only hope that selection will be fair and I am able to win many supporters. 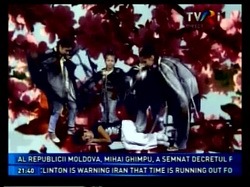 I hope they like my song "The power in your hand" as much as I do myself", says singer to Adevarul. She also spoke to Gazeta de Sud and Blogu lu cata. "I'm very emotional, because it's my first participation in such a big contest", agrees with other contestants Evelyn Iulia Dicu. "It will be very difficult, we have to work a lot, but we're confident we can do a nice show. The competition will be tough, but I hope to rise to expectation", says performer of "Radio Live", adding that she spends now two hours per day for rehearsing with her dancers. "I will sing a song "Story of a Child", written by myself with the orchestral arrangement made by Vicentiu Perniu from Al. Davila Theater. I prepare with Adina Sima and Constantin Nica and we do the choreography rehearsals in Bucharest. I hope everyone from our province will support me with their telephone votes. I want to represent Arges with honor in this competition why not, may be in the finals in Kiev as well. However, I also wish success to my colleague Ion Moses Badulescu, who will also take part in the contest", said Iulian Selea to Courieru. Claudia Rusu, performer of "Just us" has informed Monitorul that Junior Eurovision 2007 entrant Bogdan Bidasca (4 Kids) and first reserve singer Viviana Sposub and other members of "Cheia Sol" children ensemble are expected to appear in her supporting band. 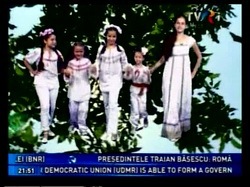 She will present her song to the local public during the "Festivalul Verii" in Botosani. Claudia's song has been based on a life-story of Mihaita, another kid from "Cheia Sol" band, who grew up in foster care. Alina Paun, who already took part in preselection of last year finishing 3rd, will perform "Fight the emotions" in duet with Adina Chis. "It will be a mix between dance and music, because this year I not only sing but also dance step" said the little artist to Gazeta de Sud. "We always wanted to get to Eurovision. For this we have been preparing a lot and we hope that our endeavor will be rewarded by fulfillment of this dream. For this, we certainly need your help. Thank you all friends for encouragement and support, Both I and Alina will not disappoint", adds Adina Chis. "Even though we live in 21st century, when we passionate about the Internet, still children are fascinated by stories of fairies and dolls. Therefore, for all children and their parents, who were one also young, I will be performing the song about "Dolls of Mr.Gepetto", the wonderful tale that everyone knows and every parent read to their children. Listening to this song, I hope to bring you back to childhood years, with it's joy, peace and quiet", says Andreea Panaitescu from Piatra Neamt. She also spoke to Adevarul. 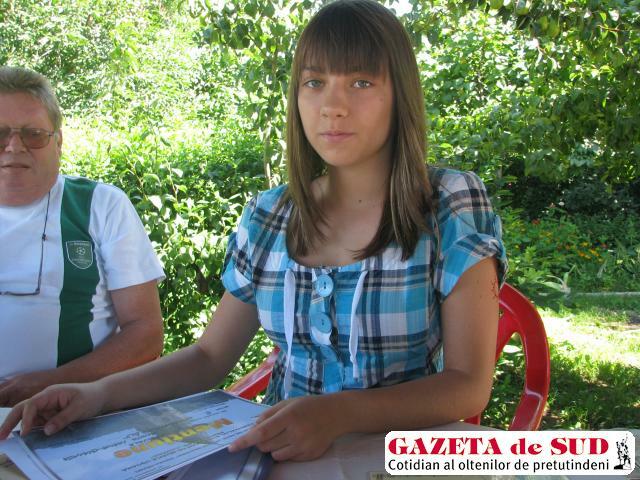 Gabriela Amzaru, Iuliana Puschila and other kids have also got publications in their support in Romanian press, asking inhabitants of their regions to support their fellow countrymen in the competition. Please, pay attention to the fact that national preselection has been rescheduled for 19th of September and will be aired at 21.10 Romanian time. The show will be presented by Alexandra Tararache, Iulia Ciobanu and Andy JugДѓnaru and winning song will be chosen in the TV voting (50%) and the points given by professional jury (50%). 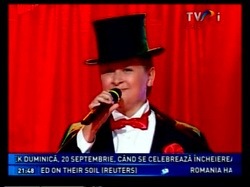 Bogdan Bidasca and Gabriela Bugle (4 Kids) will be among guest performers. РџРѕРІС‹С€РµРЅРЅС‹Р№ РёРЅС‚РµСЂРµСЃ СЃРѕРїСЂРѕРІРѕР¶РґР°РµС‚ РѕР±СЉСЏРІР»РµРЅРёРµ РёРјРµРЅ С„РёРЅР°Р»РёСЃС‚РѕРІ СЂСѓРјС‹РЅСЃРєРѕРіРѕ РѕС‚Р±РѕСЂР° РЅР° Р”РµС‚СЃРєРѕРµ Р•РІСЂРѕРІРёРґРµРЅРёРµ. РџРѕСЃРєРѕР»СЊРєСѓ РІСЃРµ СѓС‡Р°СЃС‚РІСѓСЋС‰РёРµ СЋРЅС‹Рµ РёСЃРїРѕР»РЅС‚РµР»Рё СѓР¶Рµ РјРѕРіСѓС‚ СЃС‡РёС‚Р°С‚СЊСЃСЏ Р·РІРµР·РґР°РјРё, РѕРЅРё СЏРІР»СЏСЋС‚СЃСЏ РѕР±Р»Р°РґР°С‚РµР»СЏРјРё РјРЅРѕРіРѕС‡РёСЃР»РµРЅРЅС‹С… С‚СЂРѕС„РµРµРІ РЅР°С†РёРѕРЅР°Р»СЊРЅС‹С… Рё РјСѓР·С‹РєР°Р»СЊРЅС‹С… РєРѕРЅРєСѓСЂСЃРѕРІ, РїРµРІС†С‹, РёС… СЃРµРјСЊРё Рё РїРѕРєР»РѕРЅРЅРёРєРё РЅР°РґРµСЋС‚СЃСЏ РЅР° СѓСЃРїРµС… РЅР° РЅР°С†РёРѕРЅР°Р»СЊРЅРѕРј РѕС‚Р±РѕСЂРµ. "РўРѕ, С‡С‚Рѕ СЏ РІС‹С€Р»Р° РІ С„РёРЅР°Р» - СЌС‚Рѕ РѕРґРЅРѕ РёР· СЃР°РјС‹С… Р±РѕР»СЊС€РёС… РґРѕСЃС‚РёР¶РµРЅРёР№ РІ РјРѕРµР№ РєР°СЂСЊРµСЂРµ. РЇ РІС‹Р±СЂР°Р»Р° РїРµСЃРЅСЋ "Р›РµРіРµРЅРґР° Рѕ РЎР°РЅР·РёРµРЅСЃРєРёС… С„РµСЏС…", РїРѕСЃРєРѕР»СЊРєСѓ СЏ С…РѕС‚РµР»Р° СЂР°СЃСЃРєР°Р·Р°С‚СЊ РёСЃС‚РѕСЂРёСЋ, РѕСЃРЅРѕРІР°РЅРЅСѓСЋ РЅР° СЂСѓРјС‹РЅСЃРєРёС… С‚СЂР°РґРёС†РёСЏС…. РЎ РїРѕРјРѕС‰СЊСЋ СЃРІРѕРµРіРѕ РІС‹СЃС‚СѓРїР»РµРЅРёСЏ РЅР° РєРѕРЅРєСѓСЂСЃРµ СЏ С…РѕС‡Сѓ РїРѕРєР°Р·Р°С‚СЊ РЅР°С€Рё С‚СЂР°РґРёС†РёРё, РѕР±С‹С‡Р°Рё Рё СЂСѓРјС‹РЅСЃРєРёРµ Р»РµРіРµРЅРґС‹", СЂР°СЃСЃРєР°Р·С‹РІР°РµС‚ Р“РµРѕСЂРіРёР°РЅР° Р‘Р»Р°РіРµСЃРєСѓ. РџРµСЃРЅСЏ Р“РµРѕСЂРіРёР°РЅС‹ С‚Р°РєР¶Рµ РїРѕР»СѓС‡РёР»Р° РїРѕРґРґРµСЂР¶РєСѓ РѕС‚ СѓС‡Р°СЃС‚РЅРёРєР° Р•РІСЂРѕРІРёРґРµРЅРёСЏ 2006 РњРёС…Р°СЏ РўСЂР°Р№СЃС‚Р°СЂРёСѓ: "РЎ РјРѕРµР№ С‚РѕС‡РєРё Р·СЂРµРЅРёСЏ, СЌС‚Р° РїРµСЃРЅСЏ - СЃР°РјР°СЏ Р»СѓС‡С€Р°СЏ РёР· РІСЃРµС…, РїСЂРёРЅРёРјР°СЋС‰РёС… СѓС‡Р°СЃС‚РёРµ РІ РЅР°С†РёРѕРЅР°Р»СЊРЅРѕРј РѕС‚Р±РѕСЂРµ Рё РµРµ РёСЃРїРѕР»РЅСЏРµС‚ РїРµРІРёС†Р° СЃ РїРѕС‚СЂСЏСЃР°СЋС‰РёРј РіРѕР»РѕСЃРѕРј", РѕС‚РјРµС‚РёР» РёСЃРїРѕР»РЅРёС‚РµР»СЊ. Р’ РґРµРЅСЊ РЅР°С†РёРѕРЅР°Р»СЊРЅРѕРіРѕ РѕС‚Р±РѕСЂР° РїРµРІРёС†Рµ РёСЃРїРѕР»РЅРёС‚СЃСЏ 14 Р»РµС‚. "РЇ СЃРёР»СЊРЅРѕ РЅРµСЂРІРЅРёС‡Р°СЋ, РЅРѕ СЏ РґРѕР»Р¶РµРЅ РґРµСЂР¶Р°С‚СЊ СЃРµР±СЏ РІ СЂСѓРєР°С…, С‡С‚РѕР±С‹ РјРѕСЏ РјРµС‡С‚Р° РѕСЃСѓС‰РµСЃС‚РІРёР»Р°СЃСЊ. РњС‹ РѕС‡РµРЅСЊ РјРЅРѕРіРѕ СЂР°Р±РѕС‚Р°Р»Рё РЅР°Рґ РїРѕРґРіРѕС‚РѕРІРєРѕР№ Рє РєРѕРЅРєСѓСЂСЃСѓ, СЏ РЅР°РїРёСЃР°Р» РїРµСЃРЅСЋ "Р¦РёСЂРє РїСЂРёРµР·Р¶Р°РµС‚ РІ РіРѕСЂРѕРґ", РІРјРµСЃС‚Рµ СЃ РјРѕРµР№ СЃРµРјСЊРµР№ РјС‹ РїРѕРґРіРѕС‚РѕРІРёР»Рё РЅРѕРјРµСЂ Рё СЂР°Р·СЂР°Р±РѕС‚Р°Р»Рё РґРёР·Р°Р№РЅ РєРѕСЃС‚СЋРјРѕРІ. РќР° СЂРµРїРµС‚РёС†РёРё РґРІР° СЂР°Р·Р° РІ РЅРµРґРµР»СЋ СЏ РµР·Р¶Сѓ РІ Р‘СѓС…Р°СЂРµСЃС‚. Р•СЃР»Рё РјРЅРµ СѓРґР°СЃС‚СЃСЏ РґРѕР±РёС‚СЊСЃСЏ СѓСЃРїРµС…Р° РЅР° РЅР°С†РёРѕРЅР°Р»СЊРЅРѕРј СѓСЂРѕРІРЅРµ, С‚Рѕ СЏ РїСЂРёР»РѕР¶Сѓ РІСЃРµ СЃРёР»С‹, С‡С‚РѕР±С‹ РїСЂРёРІРµР·С‚Рё Рё РѕСЃРЅРѕРІРЅРѕР№ РїСЂРёР· РІ РњРёРѕРІРµРЅРё РІ РЅРѕСЏР±СЂРµ", РѕР±РµС‰Р°РµС‚ Р�РѕРЅ РњРѕР№С€Рµ Р‘Р°РґСѓР»РµСЃРєСѓ. Р�РѕР°РЅР° РђРЅСѓС†Р° РїСЂРёР·РЅР°РµС‚, С‡С‚Рѕ РґР»СЏ РїРѕР±РµРґС‹ РЅРµРѕР±С…РѕРґРёРјРѕ РїРѕРґРіРѕС‚РѕРІРёС‚СЊ РЅР°СЃС‚РѕСЏС‰РµРµ С€РѕСѓ РЅР° СЃС†РµРЅРµ. "Р’ РґРѕРїРѕР»РЅРµРЅРёРµ Рє Р·Р°РЅСЏС‚РёСЏРј РІРѕРєР°Р»РѕРј, СЏ РїСЂРѕРІРѕР¶Сѓ С‡Р°СЃС‹ РїСЂР°РєС‚РёРєСѓСЏ РЅР°С€Сѓ СЃС†РµРЅРёС‡РµСЃРєСѓСЋ С…РѕСЂРµРѕРіСЂР°С„РёСЋ. РЇ С‚РѕР»СЊРєРѕ РЅР°РґРµСЋСЃСЊ, С‡С‚Рѕ РѕС‚Р±РѕСЂ Р±СѓРґРµС‚ С‡РµСЃС‚РЅС‹Рј Рё СЏ СЃРјРѕРіСѓ Р·Р°РІРѕРµРІР°С‚СЊ РіРѕР»РѕСЃР° РїРѕРєР»РѕРЅРЅРёРєРѕРІ. РЇ РЅР°РґРµСЋСЃСЊ, С‡С‚Рѕ "РЎРёР»Р° РІ С‚РІРѕРёС… СЂСѓРєР°С…" РїРѕРЅСЂР°РІРёС‚СЃСЏ РёРј С‚Р°РєР¶Рµ, РєР°Рє Рё РјРЅРµ СЃР°РјРѕР№", РіРѕРІРѕСЂРёС‚ РїРµРІРёС†Р°. "РњРµРЅСЏ РїРµСЂРµРїРѕР»РЅСЏСЋС‚ СЌРјРѕС†РёРё, РїРѕС‚РѕРјСѓ С‡С‚Рѕ СЌС‚Рѕ РјРѕРµ РїРµСЂРІРѕРµ СѓС‡Р°СЃС‚РёРµ РІ РєРѕРЅРєСѓСЂСЃРµ С‚Р°РєРѕРіРѕ СѓСЂРѕРІРЅСЏ", СЃРѕРіР»Р°С€Р°РµС‚СЃСЏ СЃ РґСЂСѓРіРёРјРё РєРѕРЅРєСѓСЂСЃР°РЅС‚Р°РјРё Р­РІРµР»РёРЅ Р®Р»РёСЏ Р”РёРєСѓ. "Р‘СѓРґРµС‚ РѕС‡РµРЅСЊ СЃР»РѕР¶РЅРѕ, РЅР°Рј РїСЂРµРґСЃС‚РѕРёС‚ РјРЅРѕРіРѕ РїРѕСЂР°Р±РѕС‚Р°С‚СЊ, РЅРѕ РјС‹ СѓРІРµСЂРµРЅС‹, С‡С‚Рѕ СЃРјРѕР¶РµРј РїРѕРєР°Р·Р°С‚СЊ С…РѕСЂРѕС€РµРµ С€РѕСѓ. РљРѕРЅРєСѓСЂРµРЅС†РёСЏ РѕС‡РµРЅСЊ Р±РѕР»СЊС€Р°СЏ, РЅРѕ СЏ РЅР°РґРµСЋСЃСЊ, С‡С‚Рѕ СЃРјРѕРіСѓ РѕРїСЂР°РІРґР°С‚СЊ РІРѕР·Р»РѕР¶РµРЅРЅС‹Рµ РЅР° РјРµРЅСЏ РѕР¶РёРґР°РЅРёСЏ", РіРѕРІРѕСЂРёС‚ РёСЃРїРѕР»РЅРёС‚РµР»СЊРЅРёС†Р° "Radio Live", РґРѕР±Р°РІР»СЏСЏ, С‡С‚Рѕ СЂРµРїРµС‚РёСЂСѓРµС‚ СЃРѕ СЃРІРѕРёРјРё С‚Р°РЅС†РѕСЂР°РјРё РїРѕ РґРІР° С‡Р°СЃР° РІ РґРµРЅСЊ. "РЇ РёСЃРїРѕР»РЅСЋ РїРµСЃРЅСЋ "Р�СЃС‚РѕСЂРёСЏ СЂРµР±РµРЅРєР°", РєРѕС‚РѕСЂСѓСЋ РЅР°РїРёСЃР°Р» СЏ СЃР°Рј, Р° Р°СЂР°РЅР¶РёСЂРѕРІРєСѓ РїСЂРёРіРѕС‚РѕРІРёР» Р’РёС‡РµРЅС†РёСѓ РџРµСЂРЅРёСѓ РёР· С‚РµР°С‚СЂР° РђР».Р”Р°РІРёР»Р°. РЇ РіРѕС‚РѕРІР»СЋСЃСЊ РІРјРµСЃС‚Рµ СЃ РђРґРёРЅРѕР№ РЎРёРјР° Рё РљРѕРЅСЃС‚Р°РЅС‚РёРЅРѕРј РќРёРєР° Рё РјС‹ РїСЂРѕРІРѕРґРёРј РЅР°С€Рё СЂРµРїРµС‚РёС†РёРё РІ Р‘СѓС…Р°СЂРµСЃС‚Рµ. РЇ РЅР°РґРµСЋСЃСЊ, С‡С‚Рѕ РІСЃРµ Р¶РёС‚РµР»Рё РјРѕРµР№ РѕР±Р»Р°СЃС‚Рё РїРѕРґРґРµСЂР¶Р°С‚ РјРµРЅСЏ Рё РїРѕС€Р»СЋС‚ РЎРњРЎ. РЇ С…РѕС‡Сѓ СЃ С‡РµСЃС‚СЊСЋ РїСЂРµРґСЃС‚Р°РІРёС‚СЊ РђСЂРіРµС€ РЅР° СЌС‚РѕРј РєРѕРЅРєСѓСЂСЃРµ, Рё, РїРѕС‡РµРјСѓ Р±С‹ Рё РЅРµС‚, РІРѕР·РјРѕР¶РЅРѕ Рё РІ С„РёРЅР°Р»Рµ РІ РљРёРµРІРµ. РќРѕ СЏ С‚Р°РєР¶Рµ Р¶РµР»Р°СЋ СѓСЃРїРµС…Р° Рё СЃРІРѕРµРјСѓ РґСЂСѓРіСѓ Р�РѕРЅСѓ Р‘Р°РґСѓР»РµСЃРєСѓ, РєРѕС‚РѕСЂС‹Р№ С‚Р°РєР¶Рµ РїСЂРёРЅРёРјР°РµС‚ СѓС‡Р°СЃС‚РёРµ РІ РєРѕРЅРєСѓСЂСЃРµ", РіРѕРІРѕСЂРёС‚ Р®Р»РёР°РЅ РЎРµР»РµР°. РљР»Р°СѓРґРёСЏ Р СѓСЃСѓ, РёСЃРїРѕР»РЅРёС‚РµР»СЊРЅРёС†Р° РїРµСЃРЅРё "РўРѕР»СЊРєРѕ РјС‹" СЂР°СЃСЃРєР°Р·Р°Р»Р° Рѕ С‚РѕРј, С‡С‚Рѕ СѓС‡Р°СЃС‚РЅРёРє Р”РµС‚СЃРєРѕРіРѕ Р•РІСЂРѕРІРёРґРµРЅРёСЏ 2007 Р‘РѕРіРґР°РЅ Р‘РёРґР°С€РєР° (4 Kids) Рё РёСЃРїРѕР»РЅРёС‚РµР»СЊРЅРёС†Р° РёР· СЂРµР·РµСЂРІРЅРѕРіРѕ СЃРїРёСЃРєР° Р’РёРІРёР°РЅР° РЎРїРѕСЃСѓР± Рё РґСЂСѓРіРёРµ РґРµС‚Рё РёР· Р°РЅСЃР°РјР±Р»СЏ "Cheia Sol" РїСЂРёРјСѓС‚ СѓС‡Р°СЃС‚РёРµ РІ РµРµ Р±СЌРє-РіСЂСѓРїРїРµ. РџРµСЃРЅСЏ Р±СѓРґРµС‚ РІРїРµСЂРІС‹Рµ РїСЂРµРґСЃС‚Р°РІР»РµРЅР° РјРµСЃС‚РЅРѕР№ РїСѓР±Р»РёРєРµ РЅР° С„РµСЃС‚РёРІР°Р»Рµ "Festivalul Verii" РІ Р‘РѕС‚РѕС€Р°РЅРё. РџРµСЃРЅСЏ РљР»Р°СѓРґРёРё РѕСЃРЅРѕРІР°РЅР° РЅР° СЂРµР°Р»СЊРЅРѕР№ РёСЃС‚РѕСЂРёРё Р¶РёР·РЅРё РњРёС…Р°РёС†С‹, РµС‰Рµ РѕРґРЅРѕРіРѕ СѓС‡Р°СЃС‚РЅРёРєР° РіСЂСѓРїРїС‹ "Cheia Sol", РєРѕС‚РѕСЂС‹Р№ РІС‹СЂРѕСЃ РЅР° РІРѕСЃРїРёС‚Р°РЅРёРё Сѓ РїСЂРёРµРјРЅРѕР№ СЃРµРјСЊРё. РђР»РёРЅР° РџР°СѓРЅ, РєРѕС‚РѕСЂР°СЏ СѓР¶Рµ РїСЂРёРЅРёРјР°Р»Р° СѓС‡Р°СЃС‚РёРµ РІ РїСЂРѕС€Р»РѕРіРѕРґРЅРµРј РѕС‚Р±РѕСЂРµ Рё Р·Р°РЅСЏР»Р° РІ РЅРµРј 3Рµ РјРµСЃС‚Рѕ РёСЃРїРѕР»РЅРёС‚ РїРµСЃРЅСЋ "Р‘РѕСЂСЏСЃСЊ СЃ СЌРјРѕС†РёСЏРјРё" РІ РґСѓСЌС‚Рµ СЃ РђРґРёРЅРѕР№ Р§РёС€. "Р­С‚Рѕ Р±СѓРґРµС‚ СЃРјРµСЃСЊ РјСѓР·С‹РєРё Рё С‚Р°РЅС†Р°, РїРѕС‚РѕРјСѓ С‡С‚Рѕ РІ СЌС‚РѕРј РіРѕРґСѓ СЏ Р±СѓРґСѓ РЅРµ С‚РѕР»СЊРєРѕ РїРµС‚СЊ, РЅРѕ Рё С‚Р°РЅС†РµРІР°С‚СЊ СЃС‚РµРї", СЂР°СЃСЃРєР°Р·Р°Р»Р° СЋРЅР°СЏ РїРµРІРёС†Р°. "РњС‹ РІСЃРµРіРґР° С…РѕС‚РµР»Рё РїРѕРїР°СЃС‚СЊ РЅР° Р•РІСЂРѕРІРёРґРµРЅРёРµ. Р”Р»СЏ СЌС‚РѕРіРѕ РјС‹ РјРЅРѕРіРѕ РіРѕС‚РѕРІРёР»РёСЃСЊ, Рё РЅР°РґРµРµРјСЃСЏ, С‡С‚Рѕ РЅР°С€Рё СѓСЃРёР»РёСЏ Р±СѓРґСѓС‚ РІРѕР·РЅР°РіСЂР°Р¶РґРµРЅС‹ РІРѕРїР»РѕС‰РµРЅРёРµРј СЌС‚РѕР№ РјРµС‡С‚С‹. Р”Р»СЏ СЌС‚РѕРіРѕ РЅР°Рј, РєРѕРЅРµС‡РЅРѕ Р¶Рµ, РїРѕРЅР°РґРѕР±РёС‚СЃСЏ Рё РІР°С€Р° РїРѕРјРѕС‰СЊ. РЎРїР°СЃРёР±Рѕ РІР°Рј, РґСЂСѓР·СЊСЏ, Р·Р° РІР°С€Сѓ РїРѕРґРґРµСЂР¶РєСѓ, Р° РјС‹ СЃ РђР»РёРЅРѕР№ РїРѕСЃС‚Р°СЂР°РµРјСЃСЏ РІР°СЃ РЅРµ СЂР°Р·РѕС‡Р°СЂРѕРІР°С‚СЊ", РґРѕР±Р°РІР»СЏРµС‚ РђРґРёРЅР°. "РҐРѕС‚СЏ РјС‹ Рё Р¶РёРІРµРј РІ 21Рј РІРµРєРµ, РєРѕРіРґР° РІСЃРµ РѕС…РІР°С‡РµРЅС‹ РёРЅС‚РµСЂРЅРµС‚РѕРј, РґРµС‚РµР№ РІСЃРµ РµС‰Рµ РІРѕР»РЅСѓСЋС‚ СЂР°СЃСЃРєР°Р·С‹ Рѕ РєСѓРєР»Р°С… Рё С„РµСЏС…. РџРѕСЌС‚РѕРјСѓ, РґР»СЏ РІСЃРµС… РґРµС‚РµР№ Рё РёС… СЂРѕРґРёС‚РµР»РµР№, РєРѕС‚РѕСЂС‹Рµ С‚РѕР¶Рµ РєРѕРіРґР°-С‚Рѕ Р±С‹Р»Рё РјР°Р»РµРЅСЊРєРёРјРё, СЏ СЃРїРѕСЋ РїРµСЃРЅСЋ Рѕ "РљСѓРєР»Р°С… РїР°РїС‹ РљР°СЂР»Рѕ", РїСЂРµРєСЂР°СЃРЅСѓСЋ СЃРєР°Р·РєСѓ, РєРѕС‚РѕСЂСѓСЋ Р·РЅР°СЋС‚ РІСЃРµ, Рё РєРѕС‚РѕСЂСѓСЋ РєР°Р¶РґС‹Рµ СЂРѕРґРёС‚РµР»Рё СЂР°СЃСЃРєР°Р·С‹РІР°СЋС‚ СЃРІРѕРёРј РґРµС‚СЏРј. РЇ РЅР°РґРµСЋСЃСЊ, С‡С‚Рѕ СЃР»СѓС€Р°СЏ СЌС‚Сѓ РїРµСЃРЅСЋ, РІС‹ СЃРјРѕР¶РµС‚Рµ РІРµСЂРЅСѓС‚СЊСЃСЏ РІ СЃРІРѕРё РґРµС‚СЃРєРёРµ РіРѕРґС‹, СЃ РёС… СЂР°РґРѕСЃС‚СЊСЋ, РјРёСЂРѕРј Рё РІРµСЃРµР»СЊРµРј", РіРѕРІРѕСЂРёС‚ РђРЅРґСЂРµРµР° РџР°РЅР°РёС‚РµСЃРєСѓ. РЎС‚Р°С‚СЊРё РІ РїСЂРµСЃСЃРµ Р±С‹Р»Рё С‚Р°РєР¶Рµ РїРѕСЃРІСЏС‰РµРЅС‹ Рё СѓС‡Р°СЃС‚РёСЋ Р“Р°Р±СЂРёРµР»С‹ РђРјР·Р°СЂСѓ, Р®Р»РёР°РЅС‹ РџСѓСЃС‡РёР»С‹ Рё РґСЂСѓРіРёС… РєРѕРЅРєСѓСЂСЃР°РЅС‚РѕРІ, РЎРњР� РїРѕРїСЂРѕСЃРёР»Рё Р¶РёС‚РµР»РµР№ СЂР°Р№РѕРЅРѕРІ СЃС‚СЂР°РЅС‹ РїРѕРґРґРµСЂР¶Р°С‚СЊ РЅР° РєРѕРЅРєСѓСЂСЃРµ СЃРІРѕРёС… СЃРѕРѕС‚РµС‡РµСЃС‚РІРµРЅРЅРёРєРѕРІ. РћР±СЂР°С‚РёС‚Рµ РІРЅРёРјР°РЅРёРµ РЅР° С‚Рѕ, С‡С‚Рѕ СЂСѓРјС‹РЅСЃРєРёР№ РѕС‚Р±РѕСЂ Р±С‹Р» РїРµСЂРµРЅРµСЃРµРЅ РЅР° 19Рµ СЃРµРЅС‚СЏР±СЂСЏ Рё Р±СѓРґРµС‚ РїРѕРєР°Р·Р°РЅ РІ 21.10 РјРµСЃС‚РЅРѕРіРѕ РІСЂРµРјРµРЅРё. Р’РµРґСѓС‰РёРјРё С€РѕСѓ РІС‹СЃС‚СѓРїСЏС‚ РђР»РµРєСЃР°РЅРґСЂР° РўР°СЂР°СЂР°С‡Рµ, Р®Р»РёСЏ Р§РѕР±Р°РЅСѓ Рё Р­РЅРґРё Р™СѓРіР°РЅР°СЂСѓ, РїРµСЃРЅСЏ РїРѕР±РµРґРёС‚РµР»СЊРЅРёС†Р° Р±СѓРґРµС‚ РІС‹Р±СЂР°РЅР° СЃРјРµСЃСЊСЋ РіРѕР»РѕСЃРѕРІР°РЅРёСЏ Р·СЂРёС‚РµР»РµР№ Рё РіРѕР»РѕСЃРѕРІР°РЅРёСЏ РїСЂРѕС„РµСЃСЃРёРѕРЅР°Р»СЊРЅРѕРіРѕ Р¶СЋСЂРё. Р‘РѕРіРґР°РЅ Р‘РёРґР°С€РєР° Рё Р“Р°Р±СЂРёРµР»Р° Р‘СѓРіР»Рµ (4 Kids) Р±СѓРґСѓС‚ СЃСЂРµРґРё РіРѕСЃС‚РµР№ РѕС‚Р±РѕСЂР°. 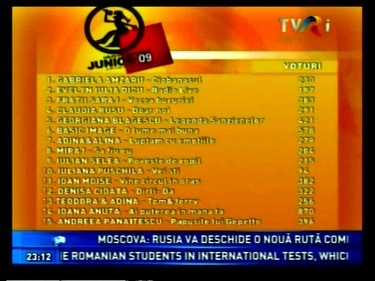 21/08 Romanian national broadcaster TVR has revealed lists of participants of national preselection 2009. 15 songs have been selected to take part in national final on 20th of September, 23 were placed into reserve list and 4 compositions have been disqualified from the competition. It is possible to listen to 15 finalists on official TVR site. 15. 'PДѓpuЕџile lui Gepetto' (Dolls of Mr.Geppetto) - Andreea Panaitescu, 10 (Piatra NeamЕЈ). ESCKaz experts favourites based on studio versions were Ion Moise Badulescu and Iuliana PuЕџchilДѓ. 4 Show Cat Megastar - Doru Ciutacu, Constanta РўРµР»РµРІРёРґРµРЅРёРµ Р СѓРјС‹РЅРёРё РѕРїСѓР±Р»РёРєРѕРІР°Р»Рѕ СЃРїРёСЃРєРё СѓС‡Р°СЃС‚РЅРёРєРѕРІ РЅР°С†РёРѕРЅР°Р»СЊРЅРѕРіРѕ РѕС‚Р±РѕСЂР° 2009. 15 РїРµСЃРµРЅ Р±С‹Р»Рѕ РѕС‚РѕР±СЂР°РЅРѕ РґР»СЏ СѓС‡Р°СЃС‚РёСЏ РІ РЅР°С†РёРѕРЅР°Р»СЊРЅРѕРј С„РёРЅР°Р»Рµ, РєРѕС‚РѕСЂС‹Р№ РїСЂРѕР№РґРµС‚ 20РіРѕ СЃРµРЅС‚СЏР±СЂСЏ, 23 РїРѕРїР°Р»Рё РІ Р»РёСЃС‚ РѕР¶РёРґР°РЅРёСЏ Рё 4 РєРѕРјРїРѕР·РёС†РёРё Р±С‹Р»Рё РґРёСЃРєРІР°Р»РёС„РёС†РёСЂРѕРІР°РЅС‹. РџСЂРѕСЃР»СѓС€Р°С‚СЊ 15 РїРµСЃРµРЅ-С„РёРЅР°Р»РёСЃС‚РѕРІ РјРѕР¶РЅРѕ РЅР° РѕС„РёС†РёР°Р»СЊРЅРѕРј СЃР°Р№С‚Рµ TVR. Р¤Р°РІРѕСЂРёС‚С‹ СЌРєСЃРїРµСЂС‚РѕРІ ESCKaz, РѕСЃРЅРѕРІС‹РІР°СЏСЃСЊ РЅР° СЃС‚СѓРґРёР№РЅС‹С… РІРµСЂСЃРёСЏС… - Ion Moise Badulescu Рё Iuliana PuЕџchilДѓ. 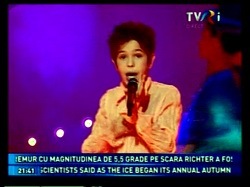 19/06 Romanian broadcaster TVR has launched national preselection for Junior Eurovision Song Contest 2009. This year, TVR has followed "strong recommendation" of EBU to conduct national preselection not earlier than 3 monthes before the contest and have moved it from June to autumn. Deadline to submit entries has been set for August 14. On August 19 professional jury will select 10-15 participants for the national final which has been scheduled for September 19. Winner will be selected by combination of televoting and jury voting. Complete regulations of the national contest are available on TVR website. Р СѓРјС‹РЅСЃРєР°СЏ С‚РµР»РµРєРѕРјРїР°РЅРёСЏ TVR РѕР±СЉСЏРІРёР»Р° Рѕ РЅР°С‡Р°Р»Рµ РЅР°С†РёРѕРЅР°Р»СЊРЅРѕРіРѕ РѕС‚Р±РѕСЂР° РЅР° Р”РµС‚СЃРєРѕРµ Р•РІСЂРѕРІРёРґРµРЅРёРµ 2009. Р’ СЌС‚РѕРј РіРѕРґСѓ TVR РїРѕСЃР»РµРґРѕРІР°Р»Рѕ СЂРµРєРѕРјРµРЅРґР°С†РёРё Р•Р’РЎ РїСЂРѕРІРѕРґРёС‚СЊ РѕС‚Р±РѕСЂС‹ РЅРµ СЂР°РЅРµРµ, С‡РµРј Р·Р° 3 РјРµСЃСЏС†Р° РґРѕ РєРѕРЅРєСѓСЂСЃР° Рё РїРµСЂРµРЅРµСЃР»Р° СЃРІРѕР№ С„РёРЅР°Р» СЃ РёСЋРЅСЏ РЅР° РѕСЃРµРЅСЊ. РљСЂР°Р№РЅРёР№ СЃСЂРѕРє РїСЂРёРµРјР° Р·Р°СЏРІРѕРє - 14 Р°РІРіСѓСЃС‚Р°. 19 Р°РІРіСѓСЃС‚Р° РїСЂРѕС„РµСЃСЃРёРѕРЅР°Р»СЊРЅРѕРµ Р¶СЋСЂРё РѕС‚Р±РµСЂРµС‚ 10-15 РїРµСЃРµРЅ РґР»СЏ СѓС‡Р°СЃС‚РёСЏ РІ С„РёРЅР°Р»Рµ РЅР°С†РёРѕРЅР°Р»СЊРЅРѕРіРѕ РѕС‚Р±РѕСЂР°, РєРѕС‚РѕСЂС‹Р№ РЅР°Р·РЅР°С‡РµРЅ РЅР° 19 СЃРµРЅС‚СЏР±СЂСЏ. РџРѕР±РµРґРёС‚РµР»СЊ Р±СѓРґРµС‚ РІС‹Р±СЂР°РЅ СЃРѕРІРјРµСЃС‚РЅС‹Рј СЂРµС€РµРЅРёРµРј С‚РµР»РµР·СЂРёС‚РµР»РµР№ Рё Р¶СЋСЂРё. РЎ РїРѕР»РЅС‹Рј С‚РµРєСЃС‚РѕРј РїСЂР°РІРёР» РѕС‚Р±РѕСЂР° РјРѕР¶РЅРѕ РѕР·РЅР°РєРѕРјРёС‚СЊСЃСЏ РЅР° СЃР°Р№С‚Рµ TVR.